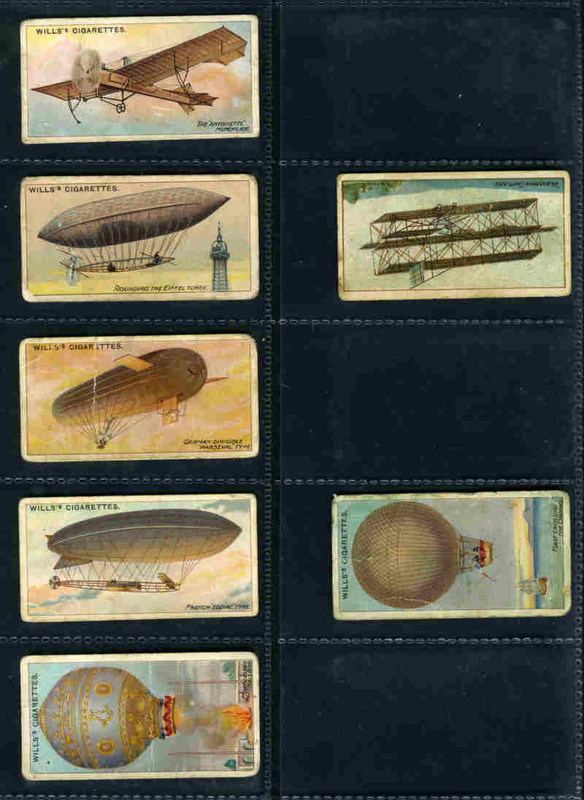 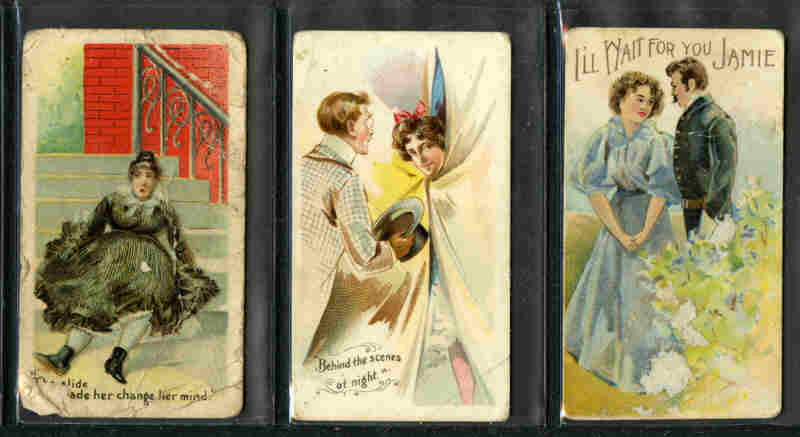 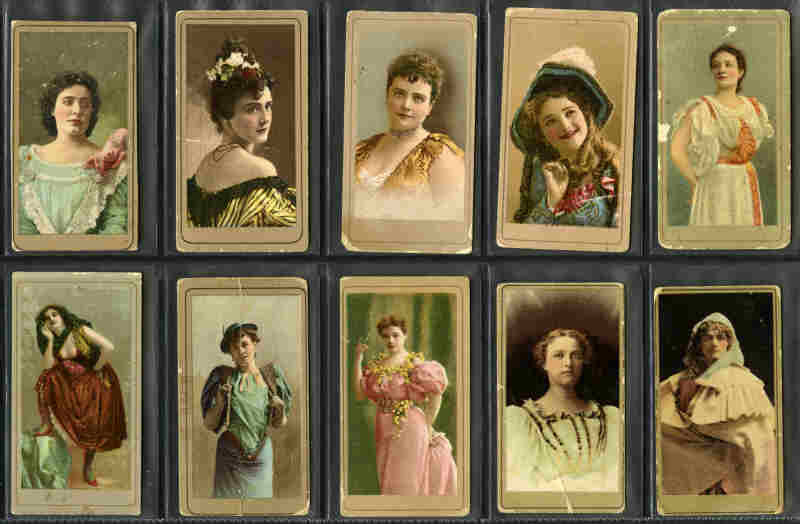 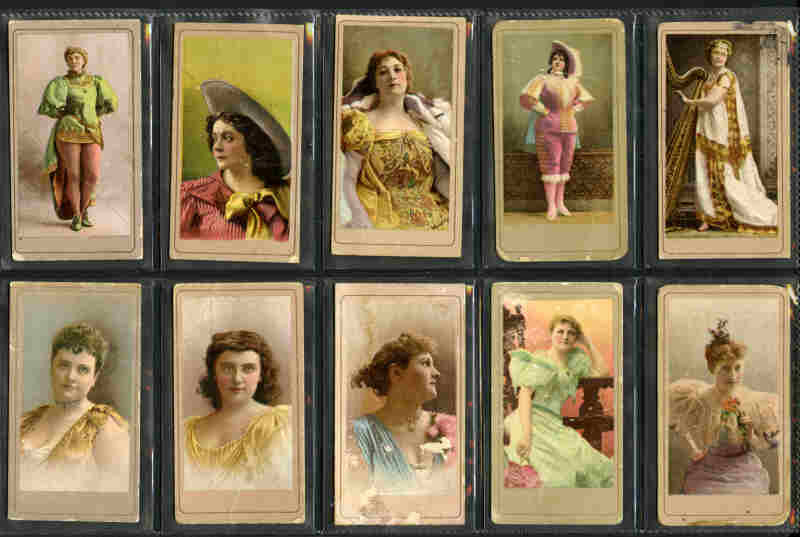 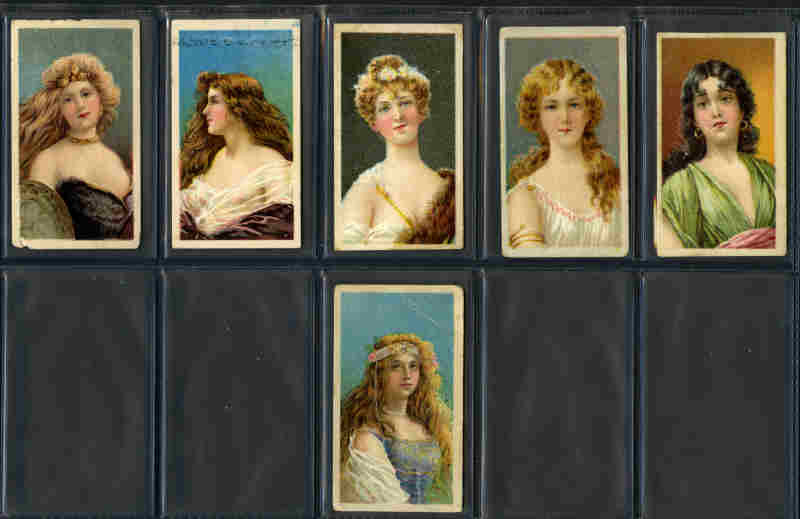 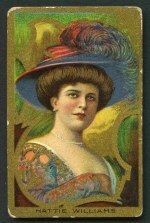 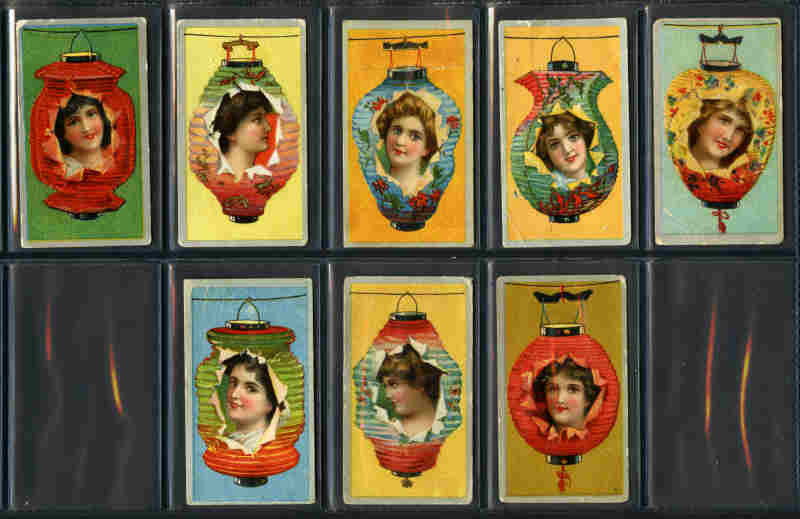 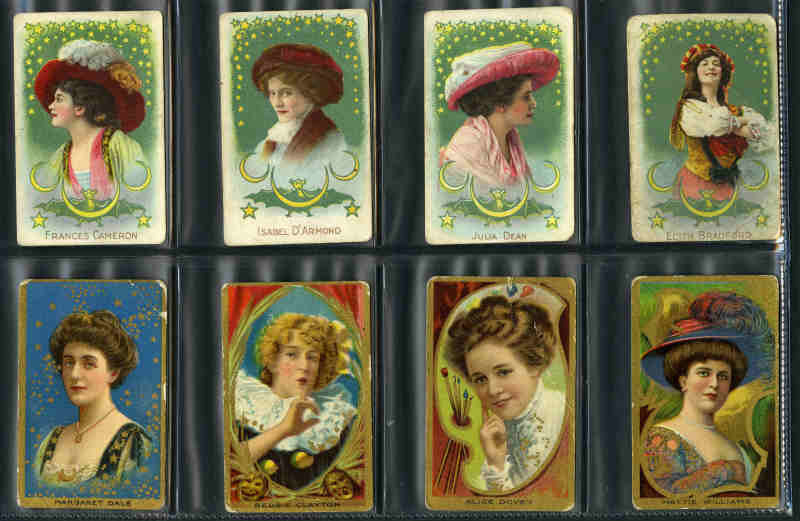 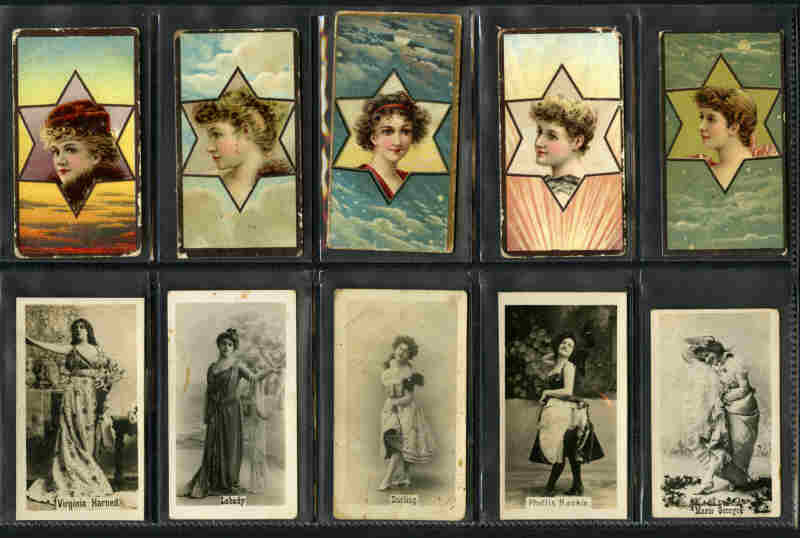 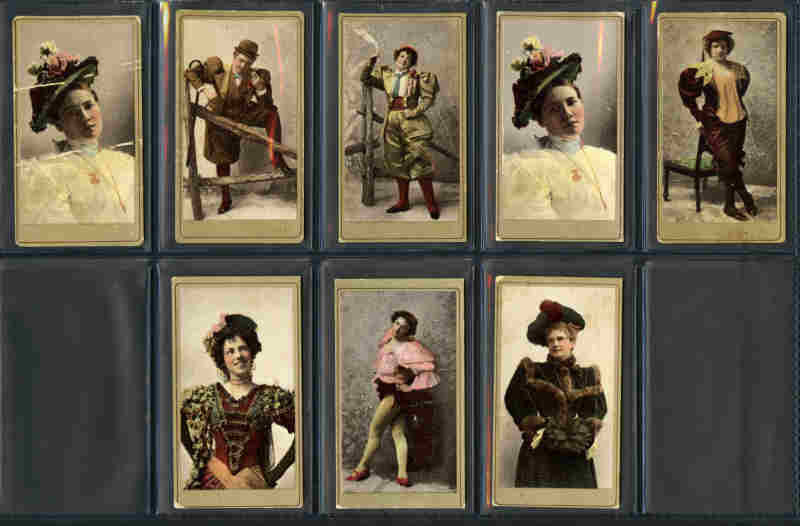 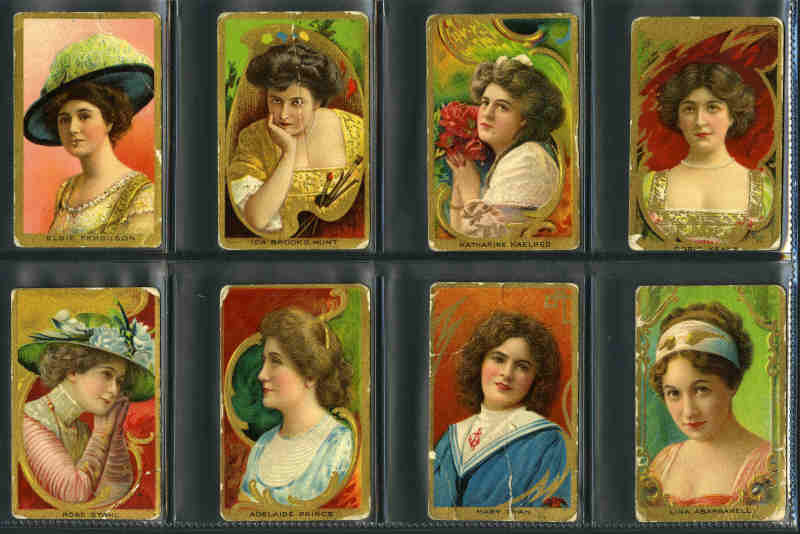 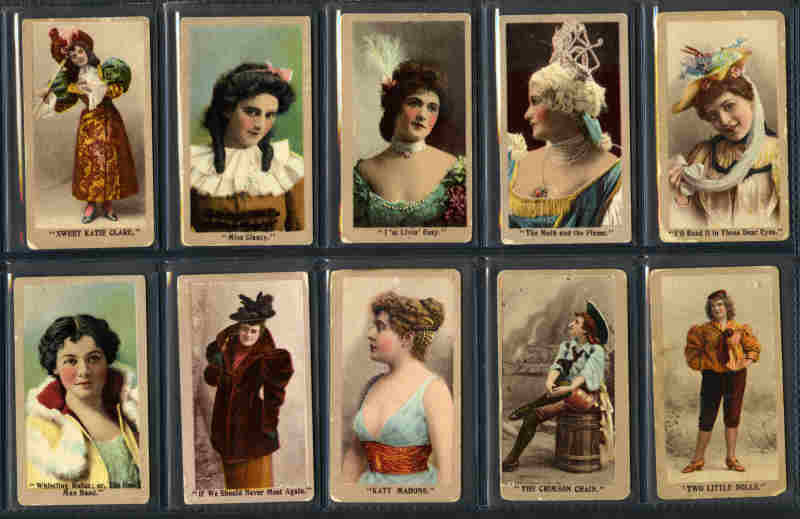 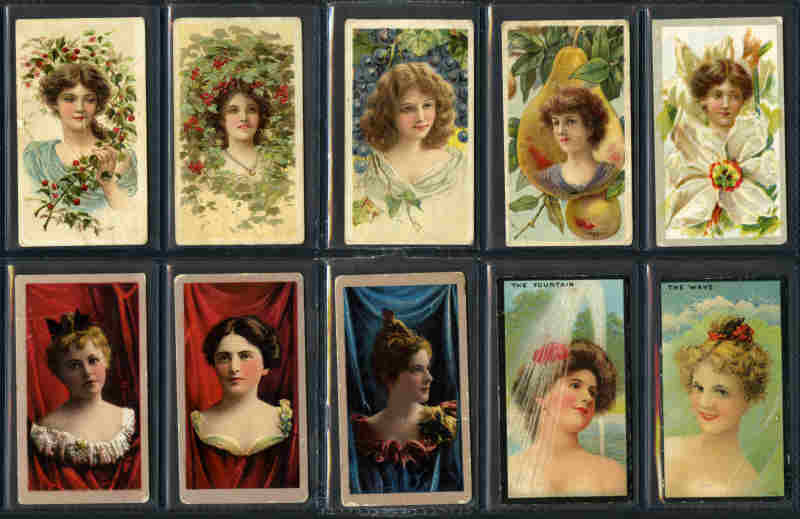 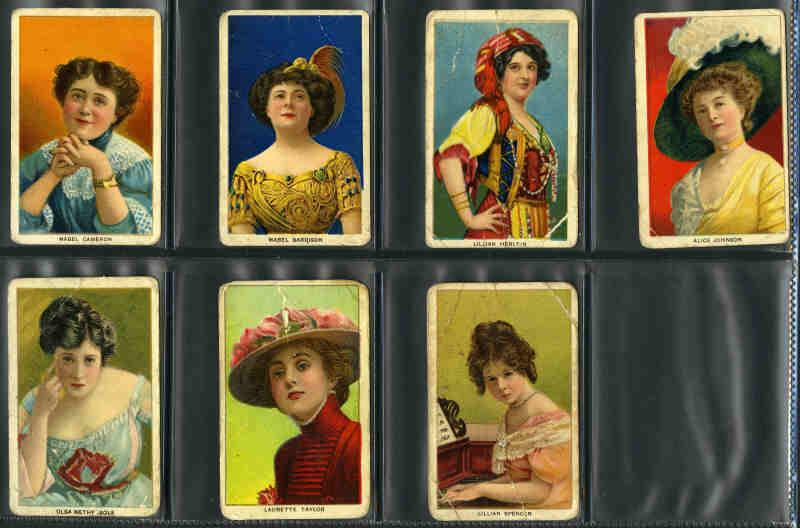 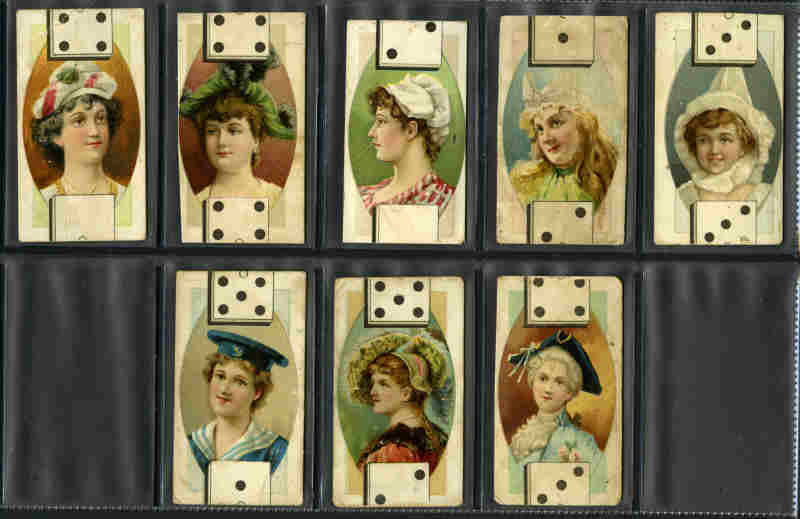 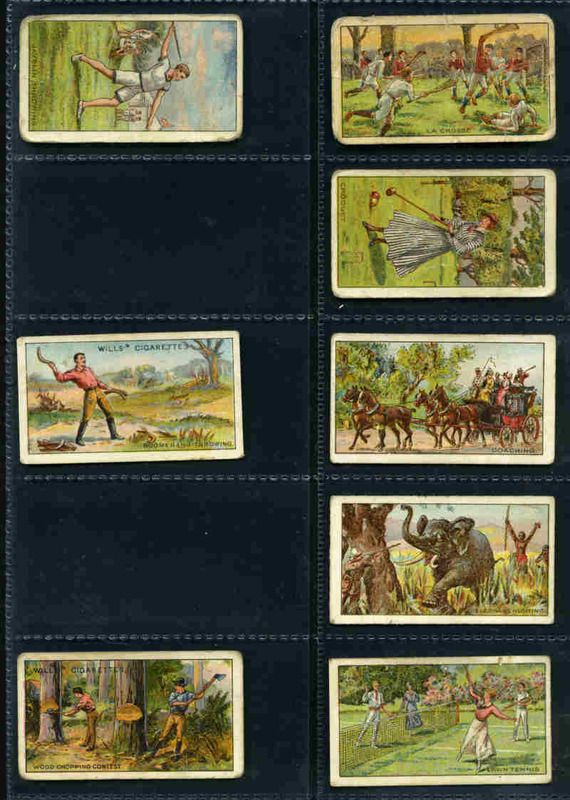 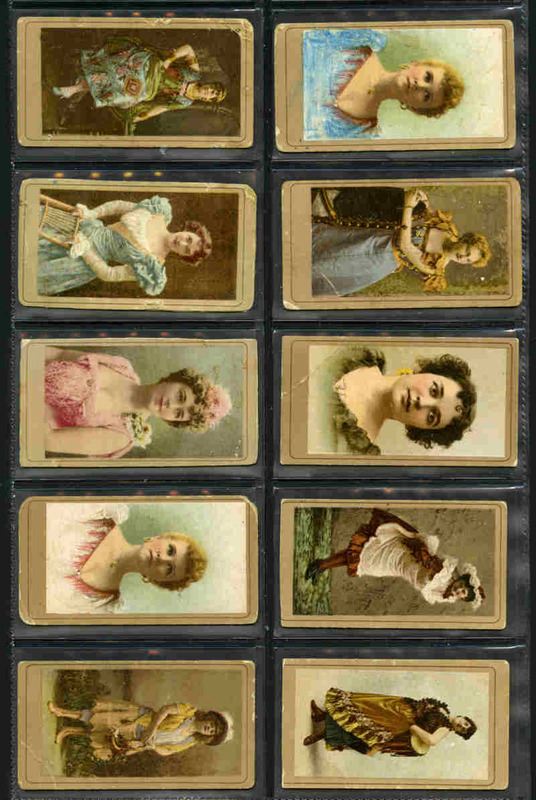 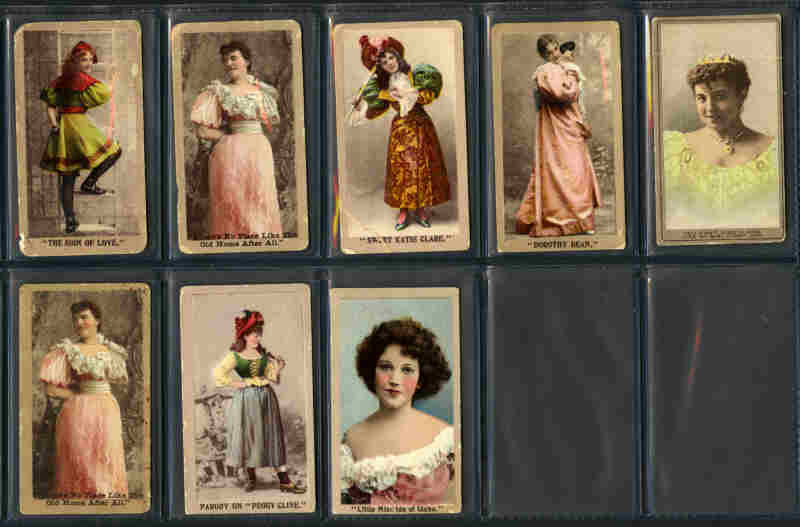 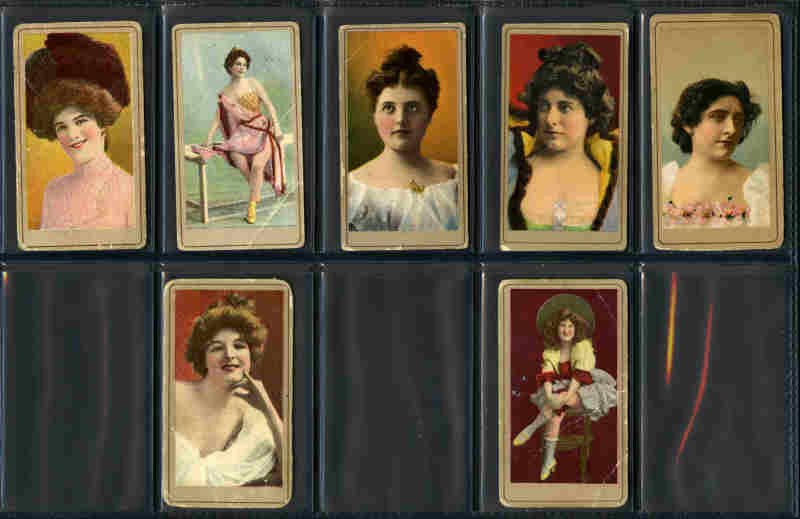 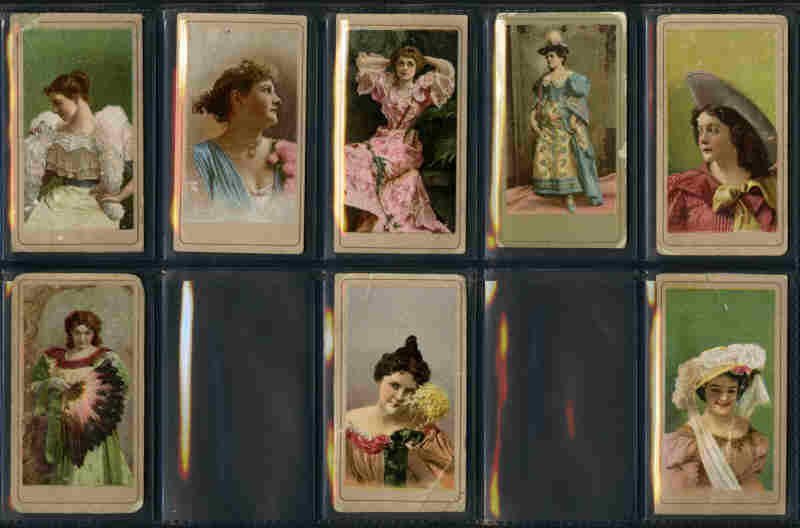 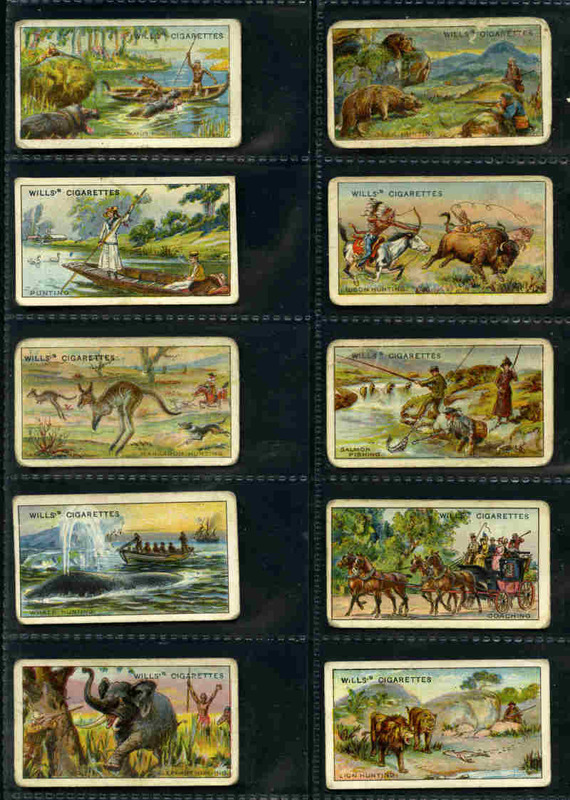 ATC 1890-1902 Beauties and Songs collection of 170 mainly different cigarette cards including ATC Tobacco Co of Victoria (18), ACT Tobacco Co of N.S.W. 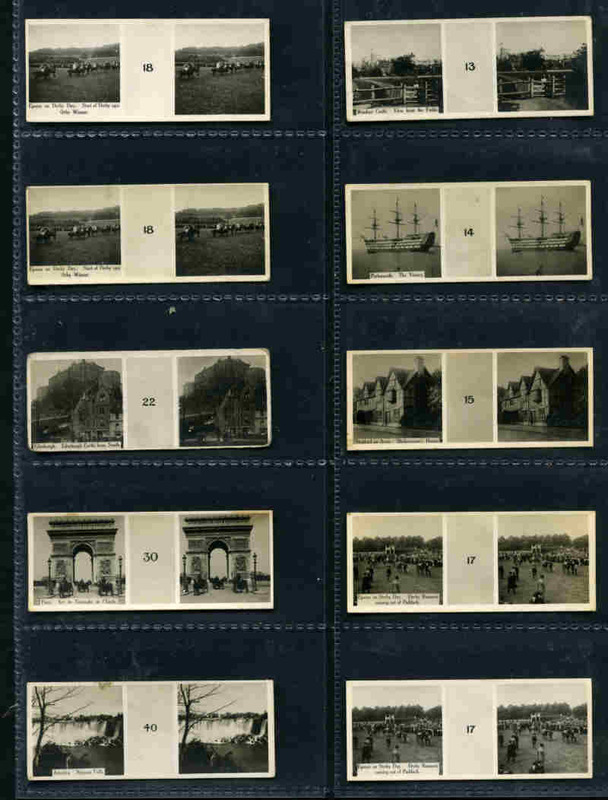 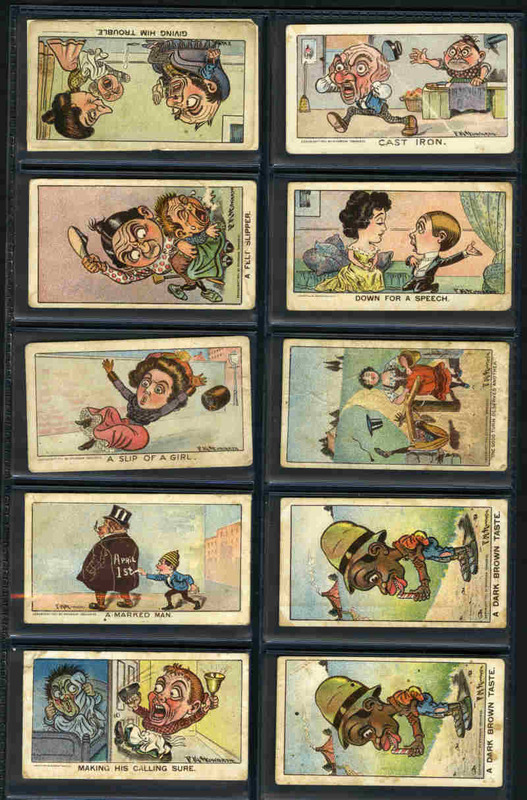 2 different types (22), Light and Dark Brown Frame Lines with mixed backs (23, inc 4 with scarce Blue Backs), Domino Girls (8), Fruit Girls (4), Lantern Girls (8), Curtain Girls (3), Stippled Background (6), Songs various issues (51), Star Girls (5), Water Girls (3), Beauties Numbered (3) and Actresses Photographic (11). 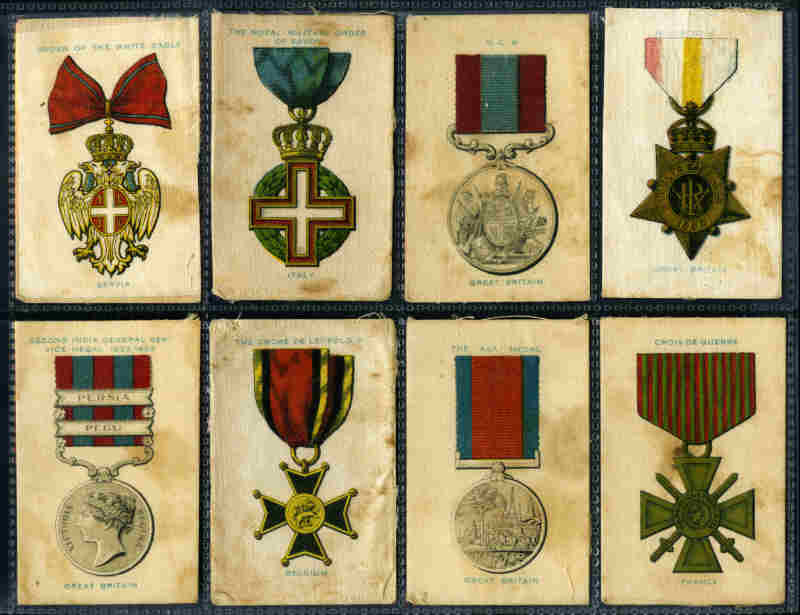 Some with faults, many in G/VG condition. 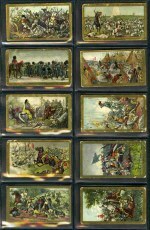 Catalogue Value £2,030.00. 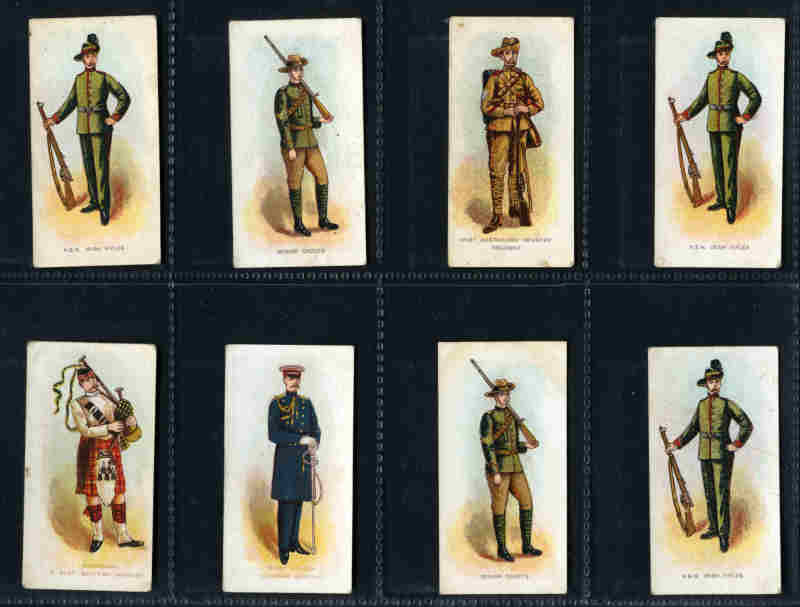 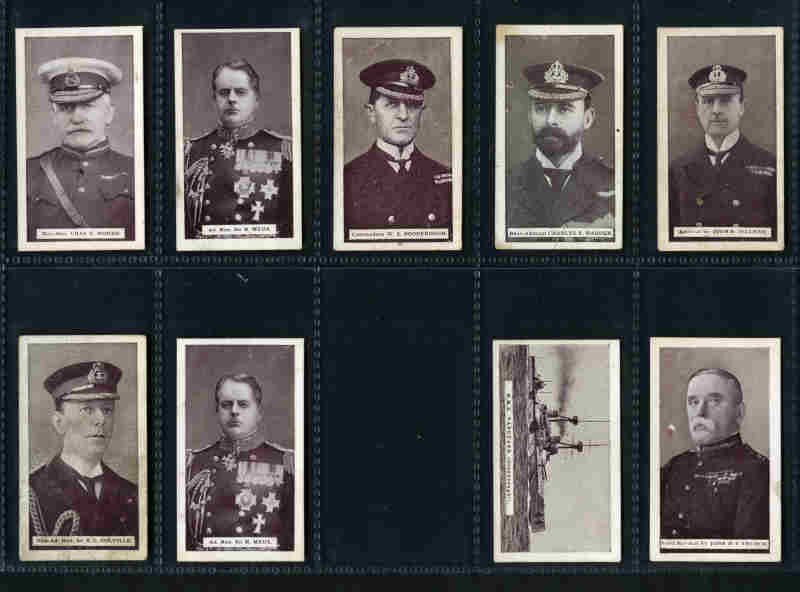 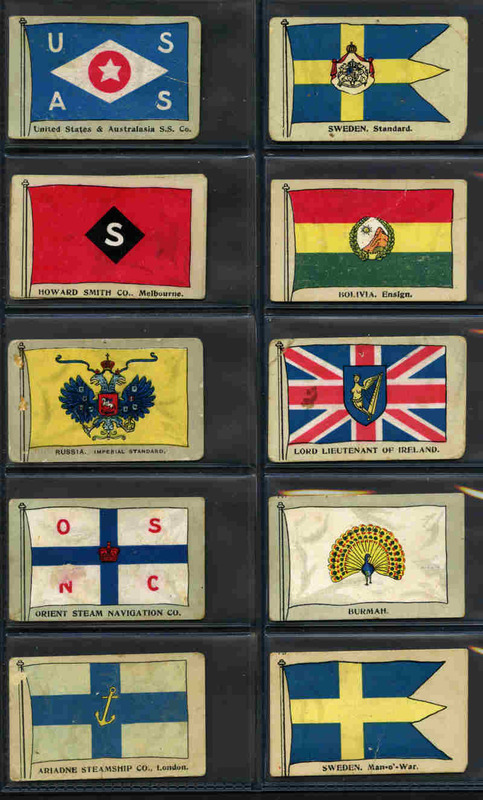 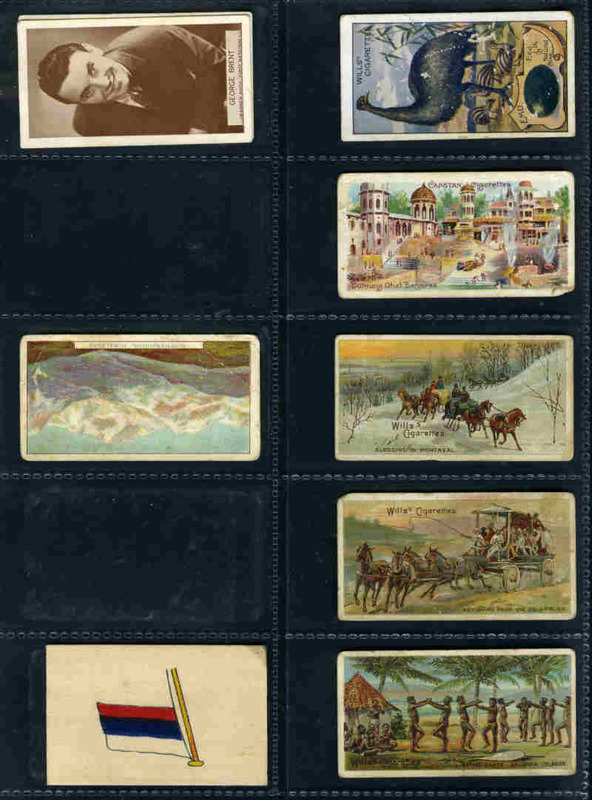 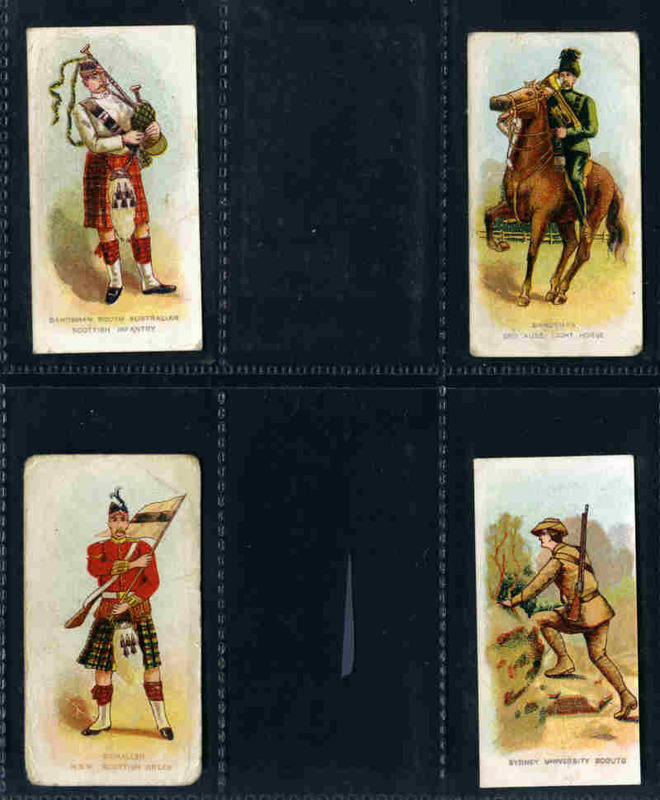 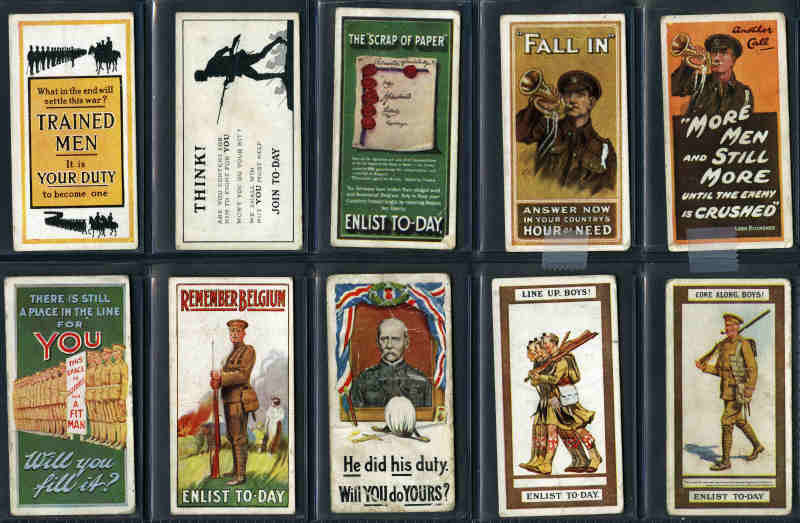 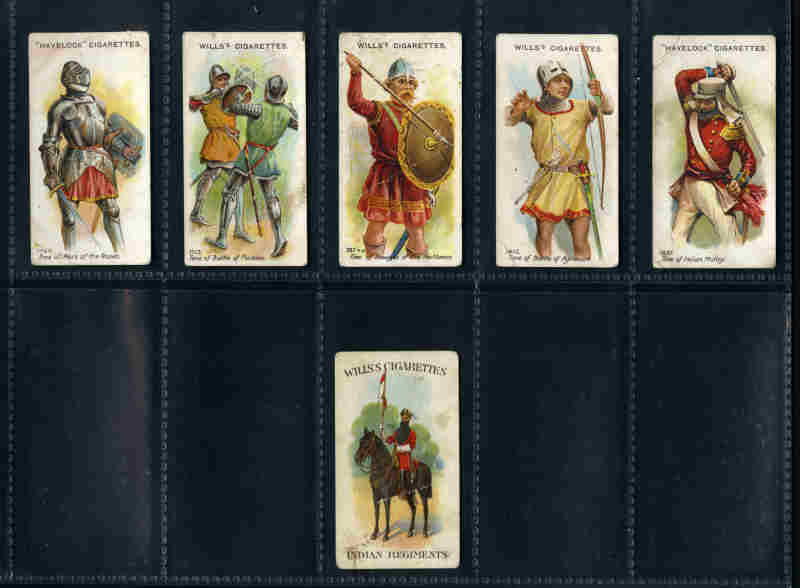 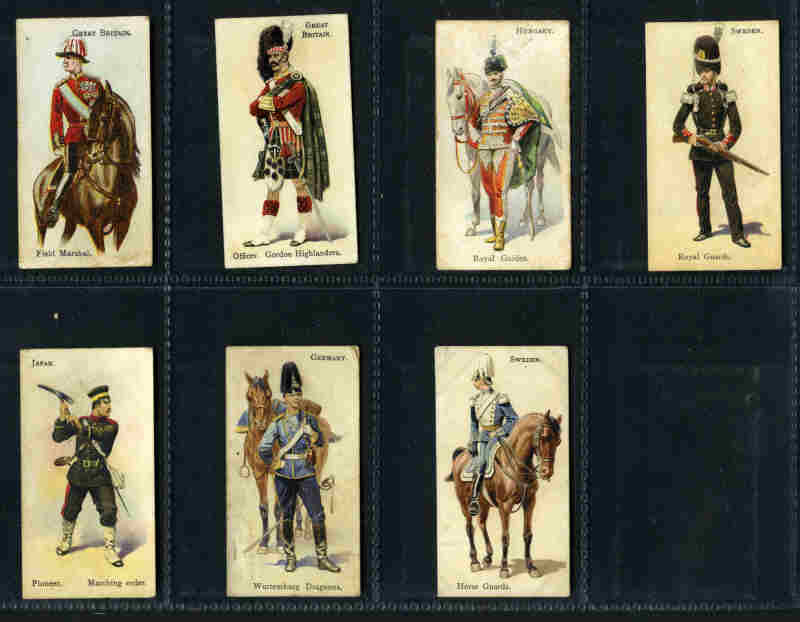 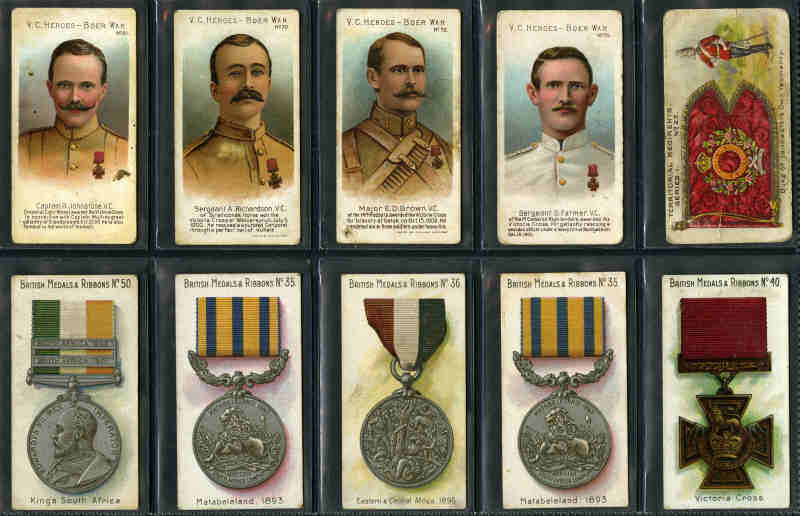 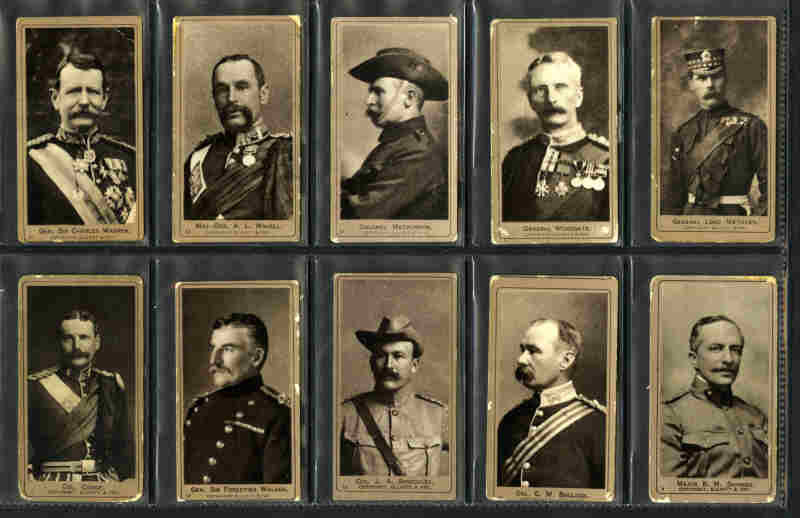 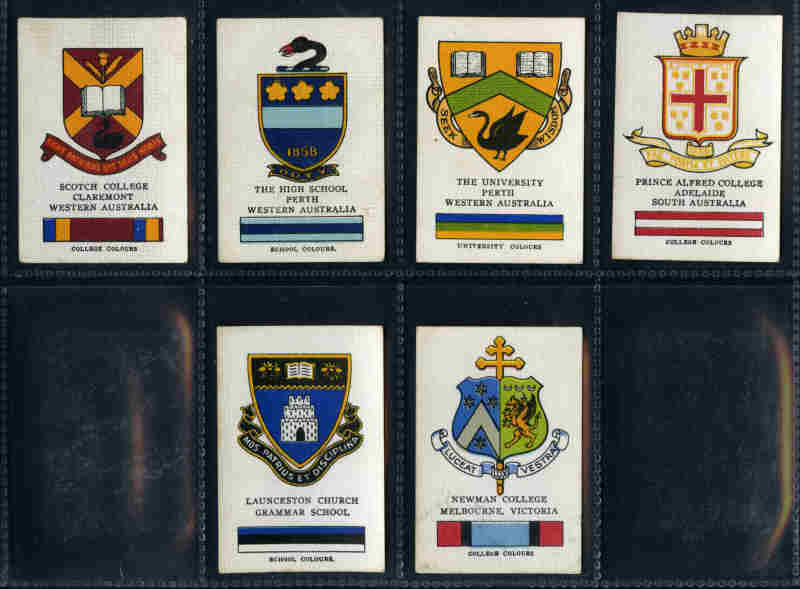 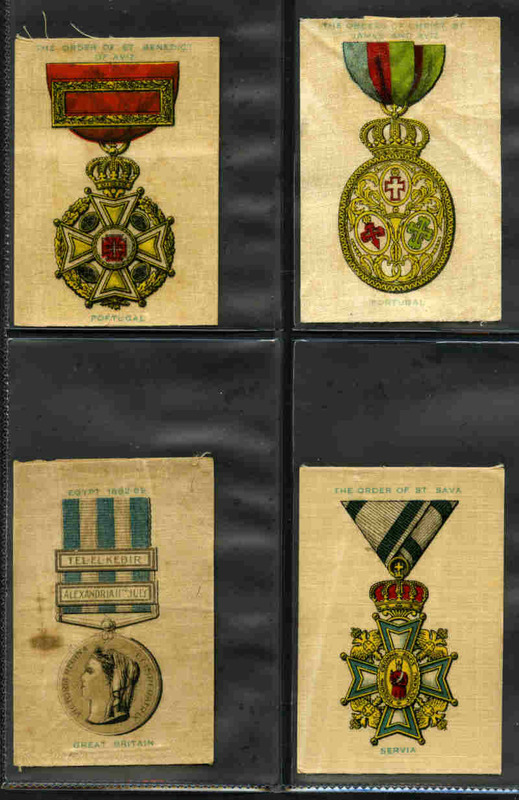 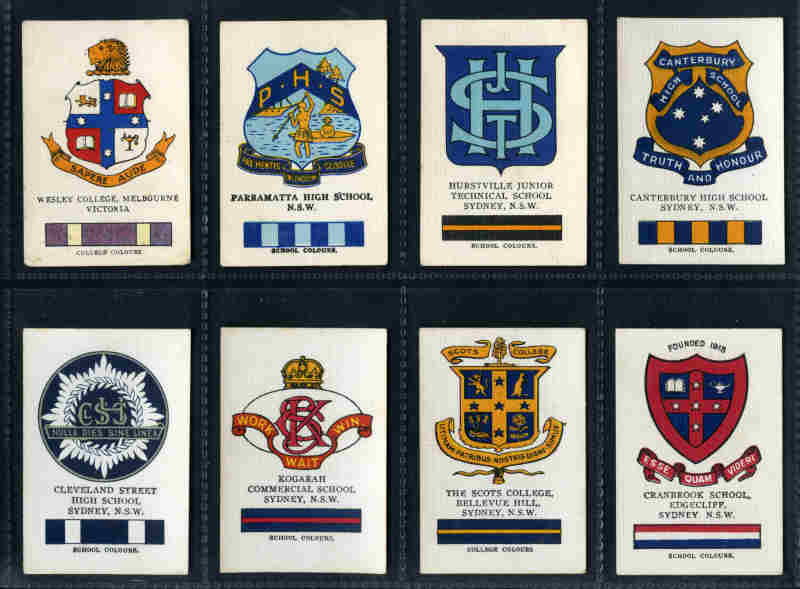 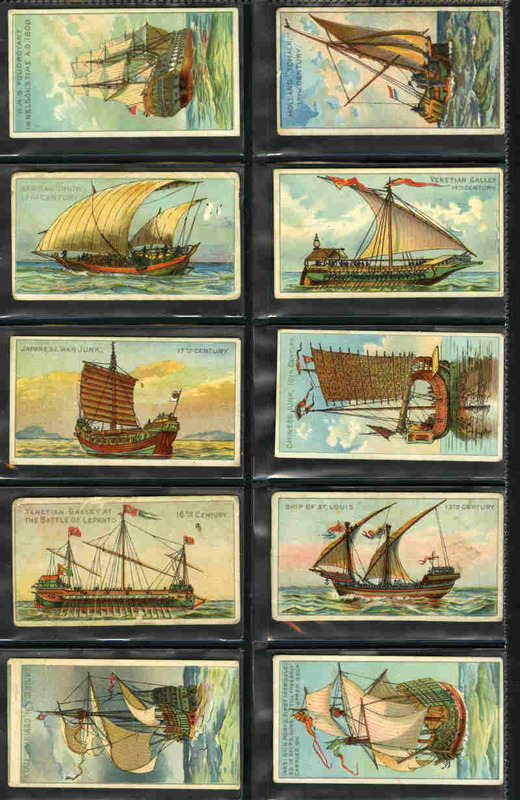 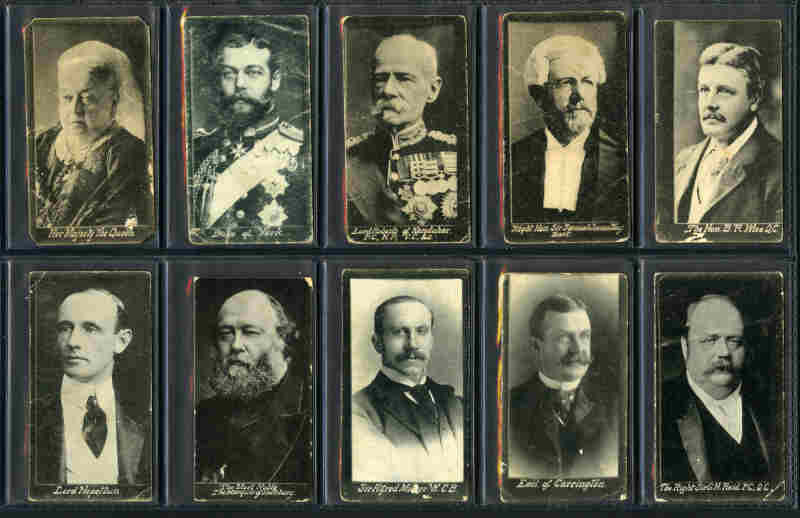 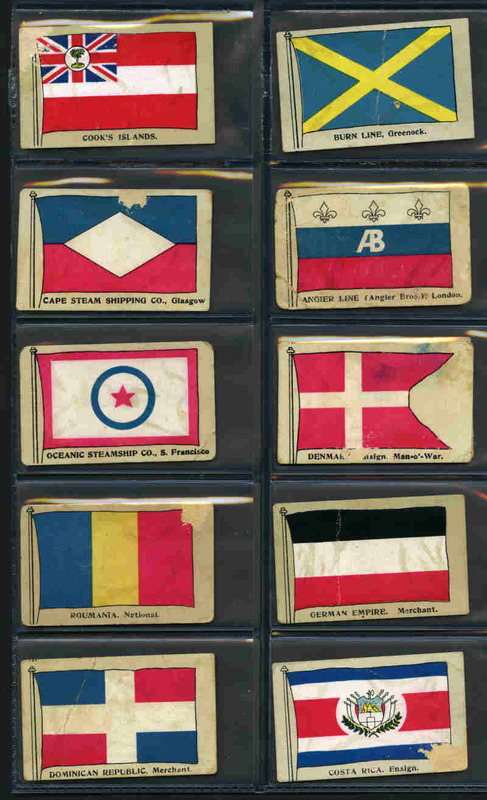 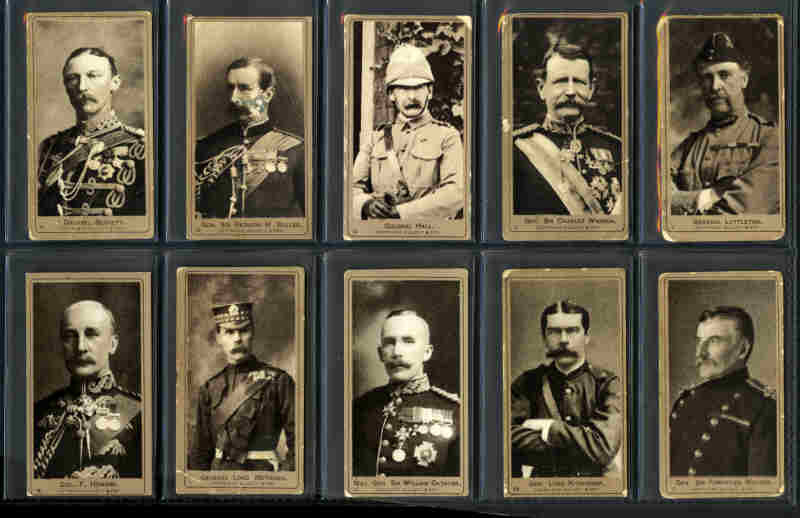 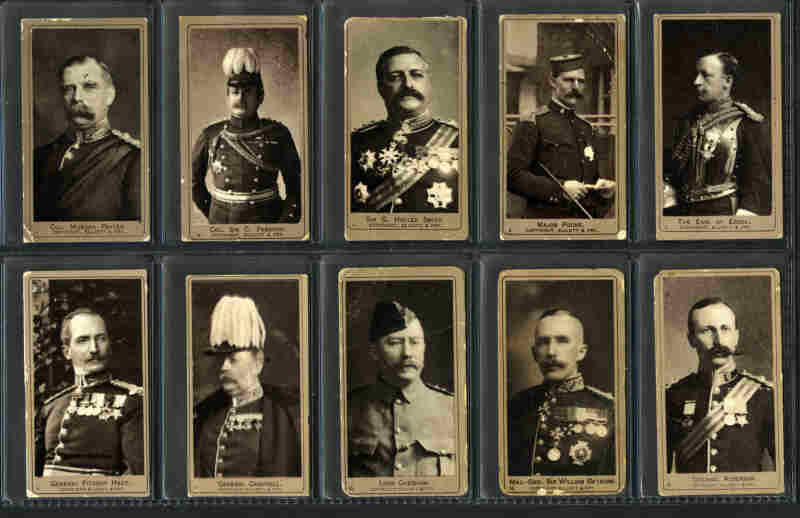 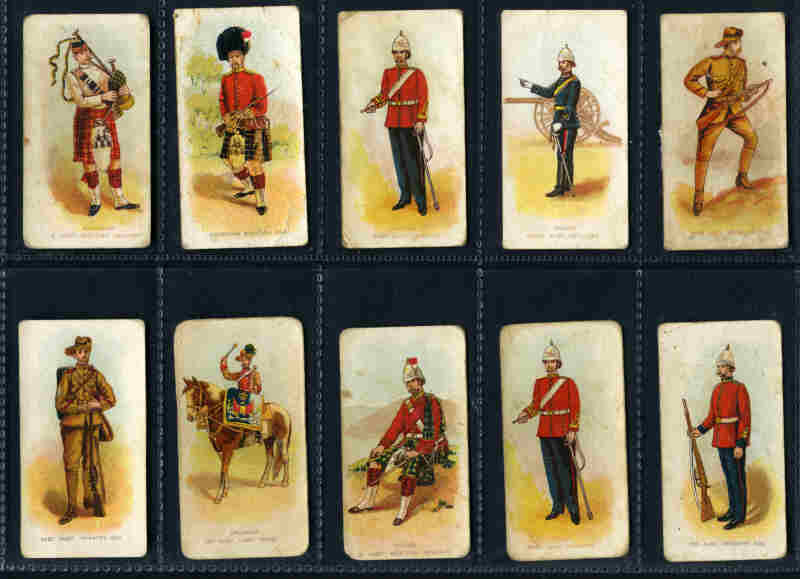 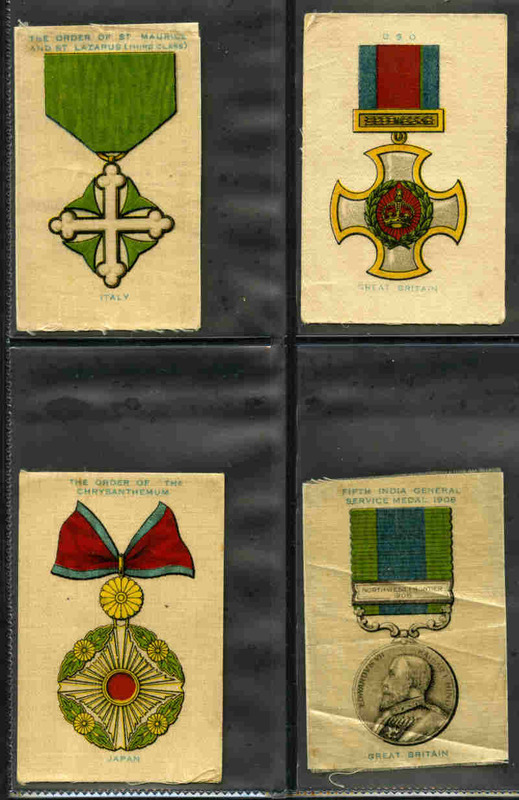 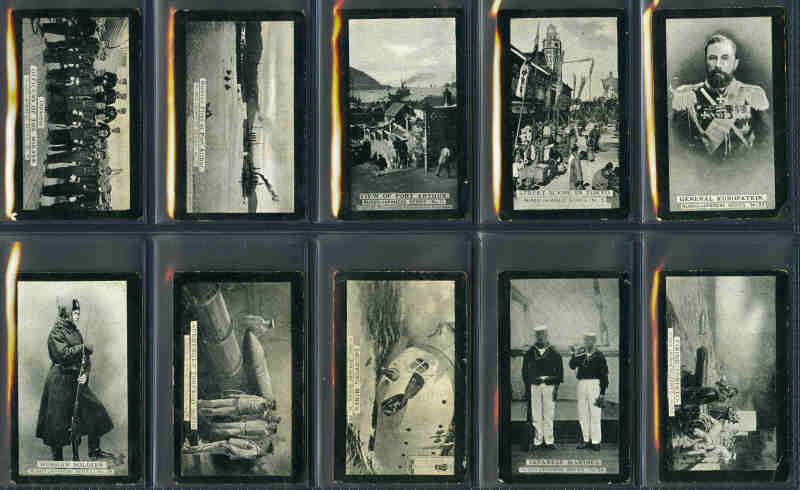 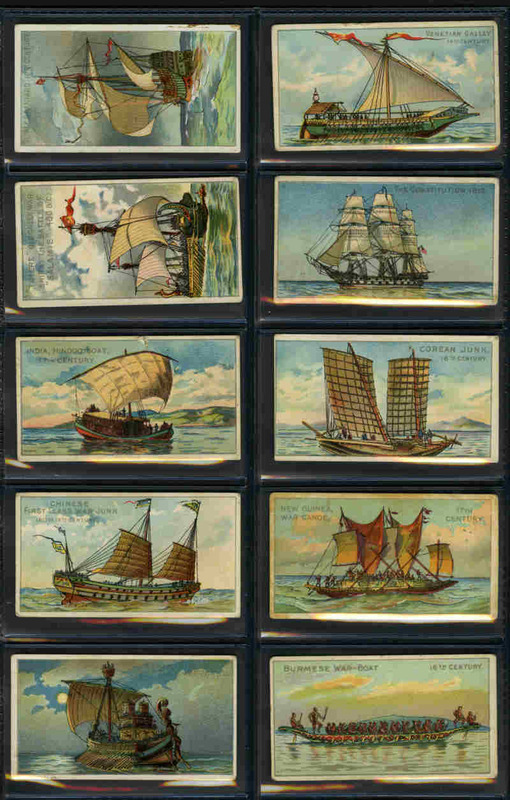 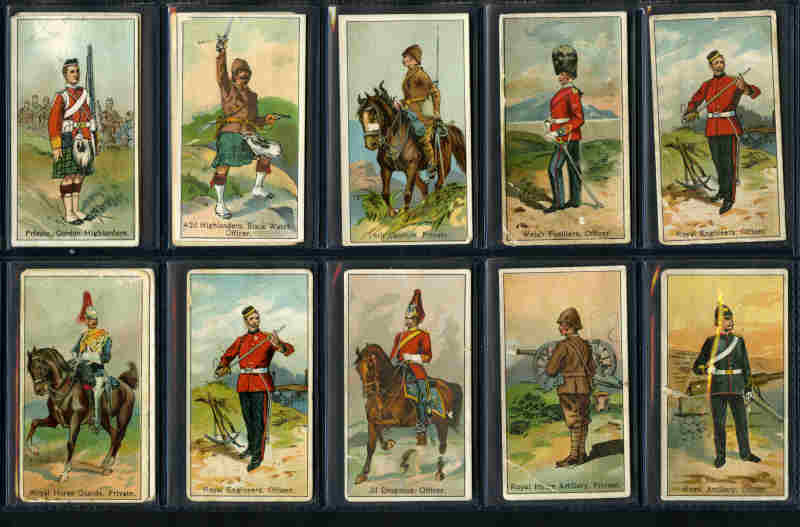 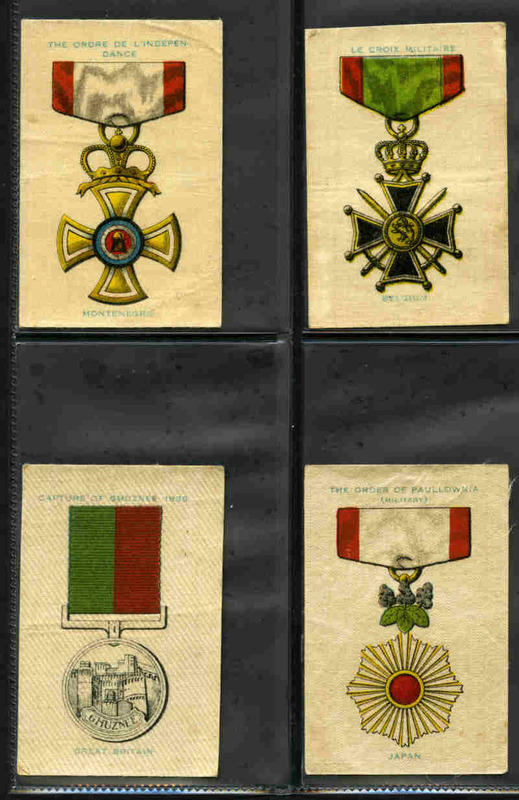 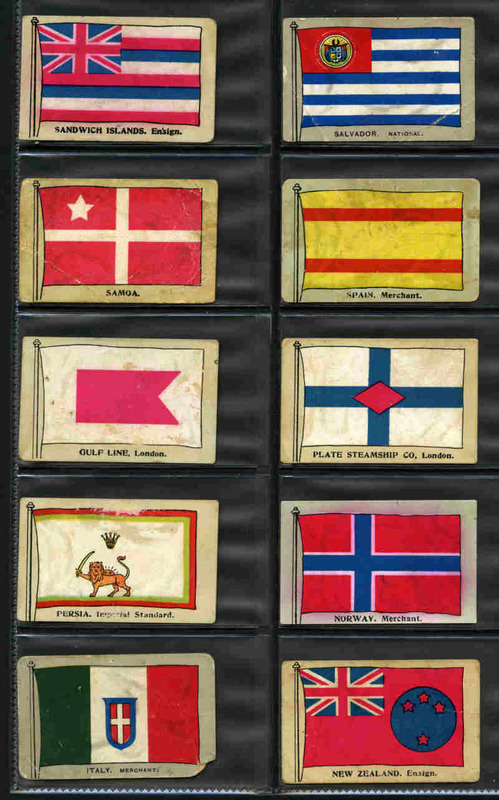 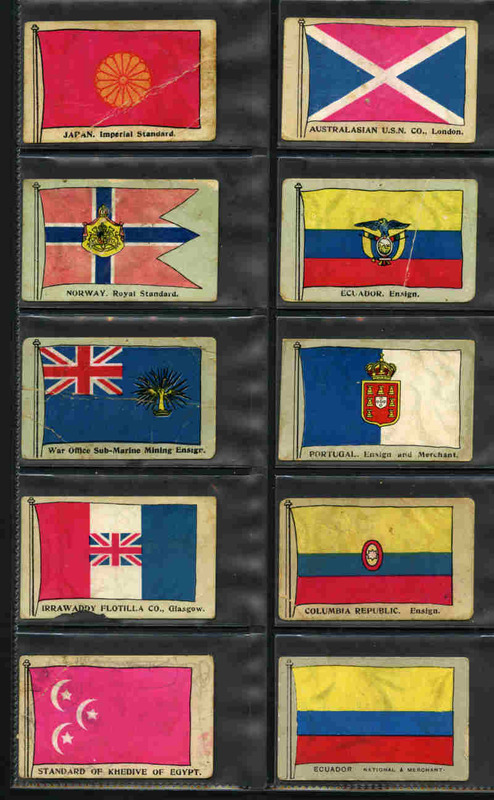 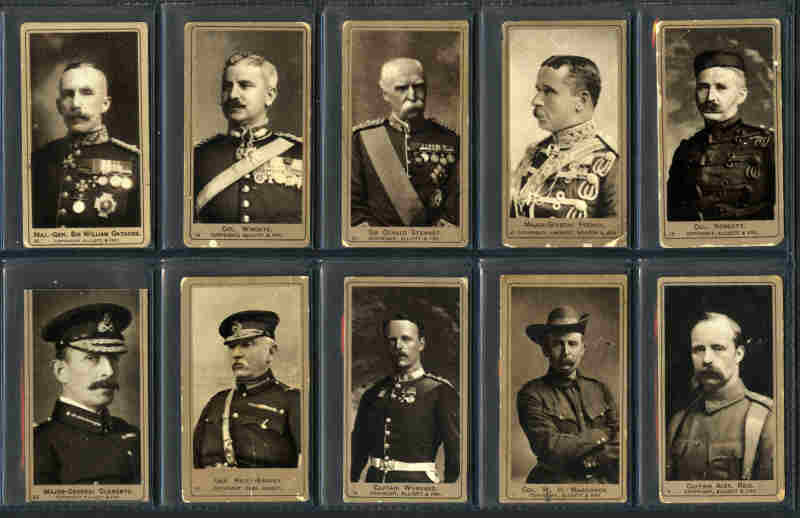 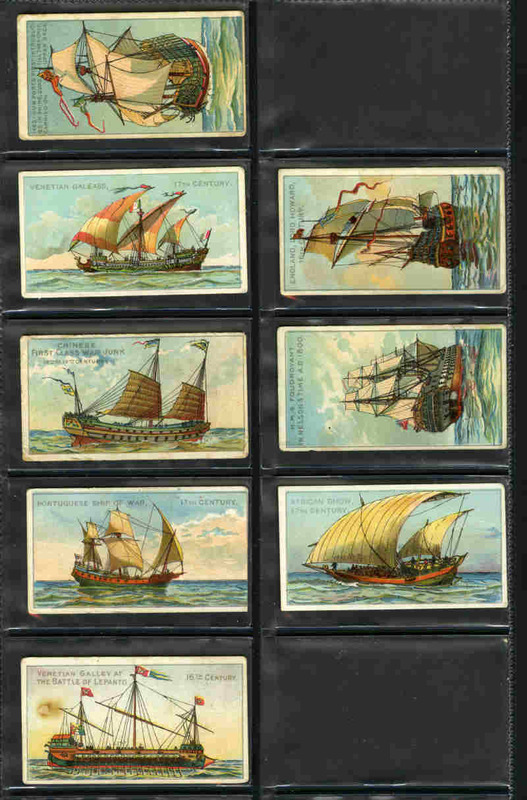 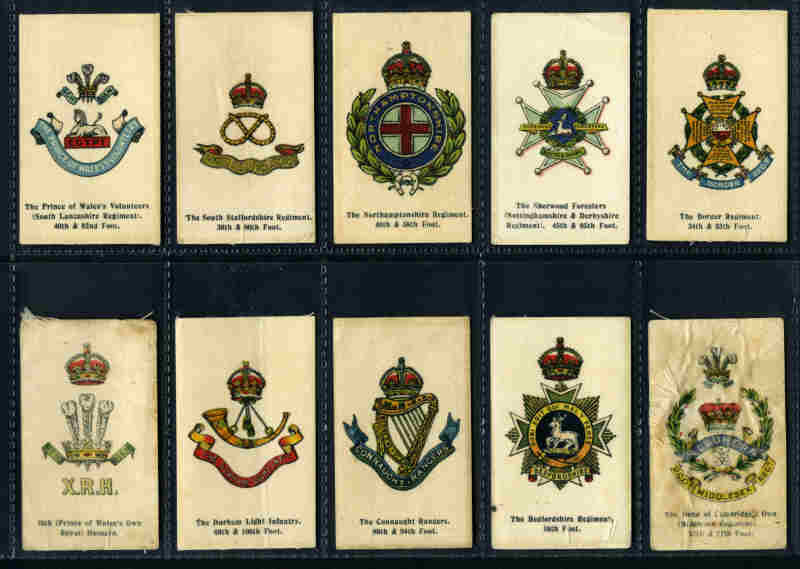 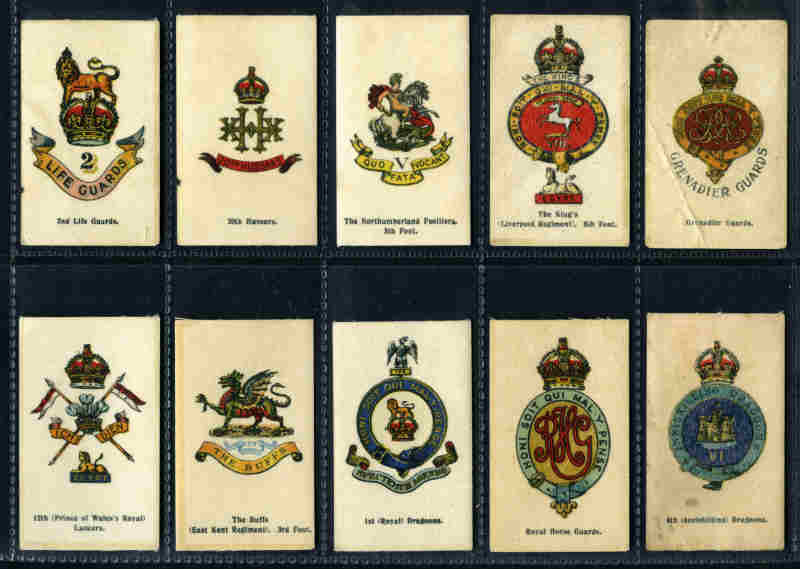 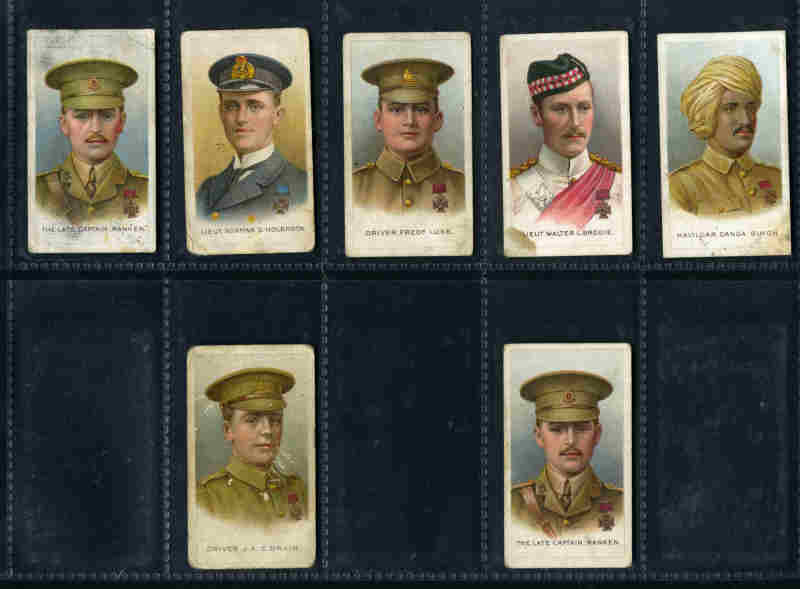 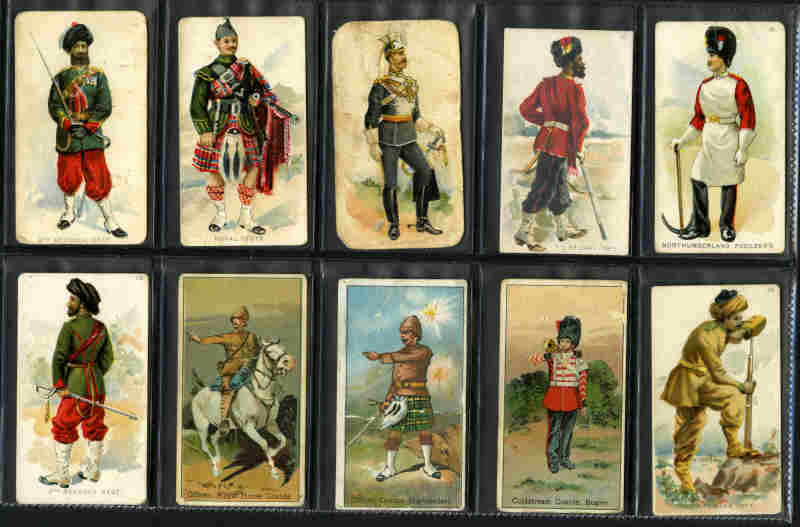 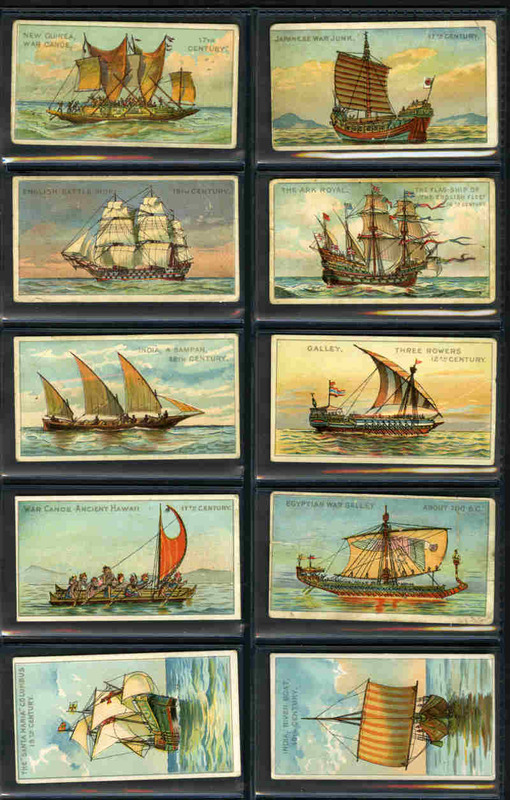 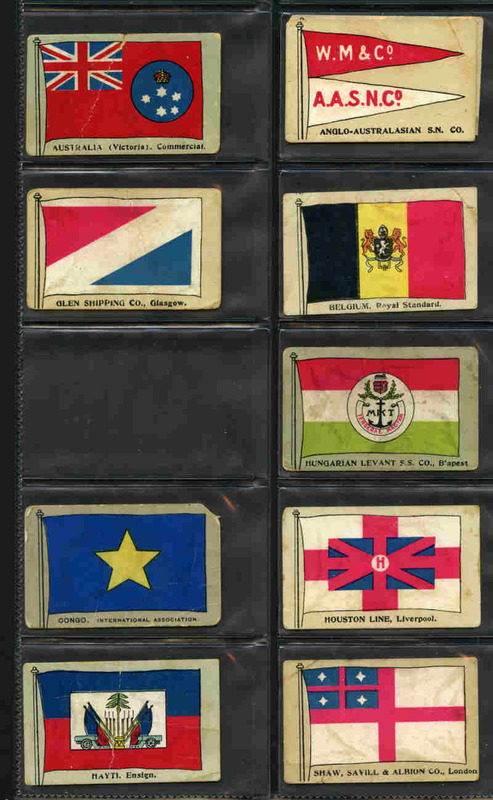 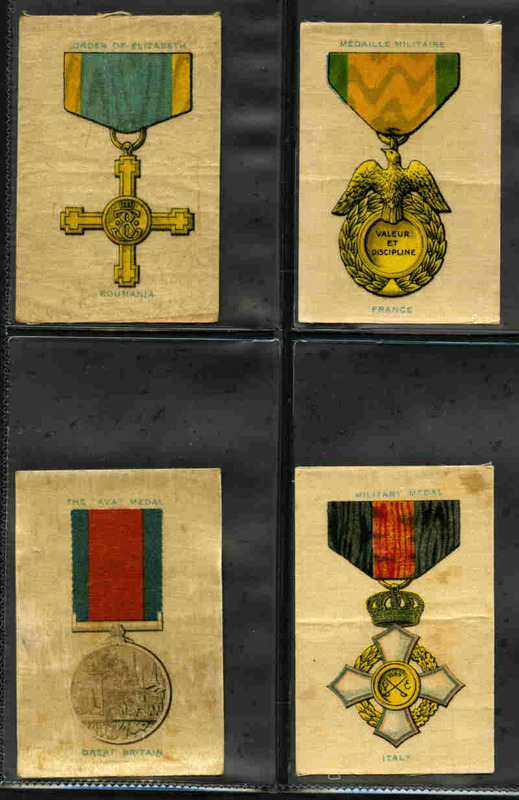 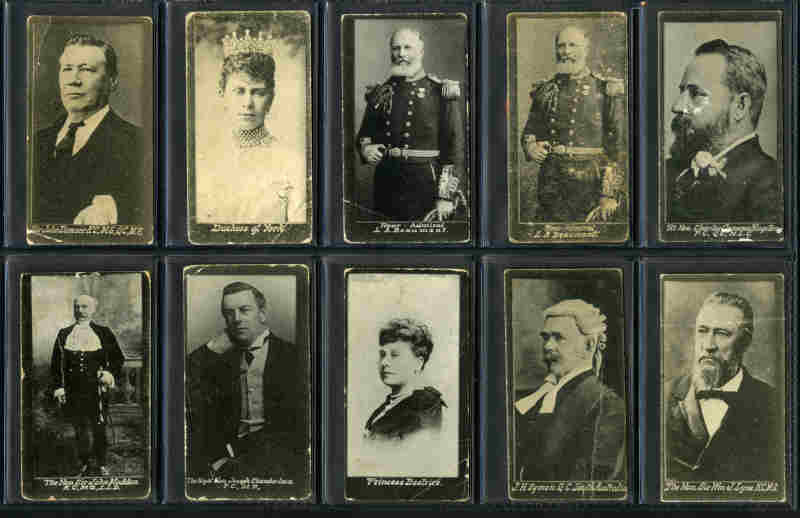 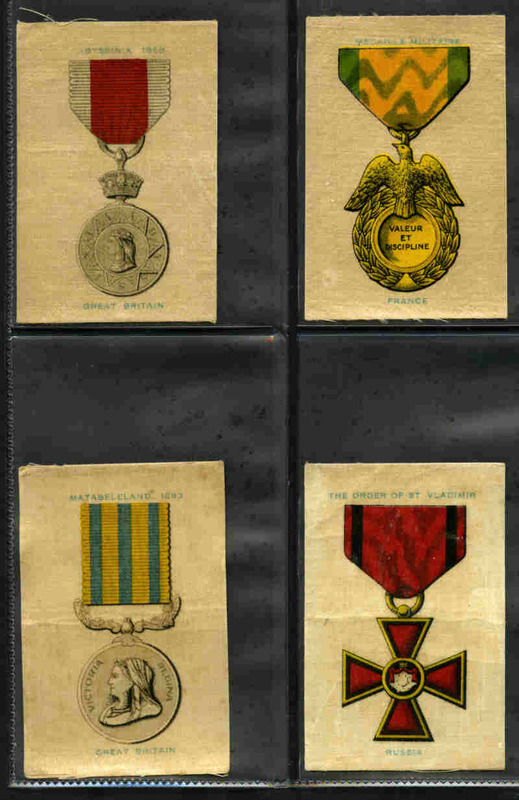 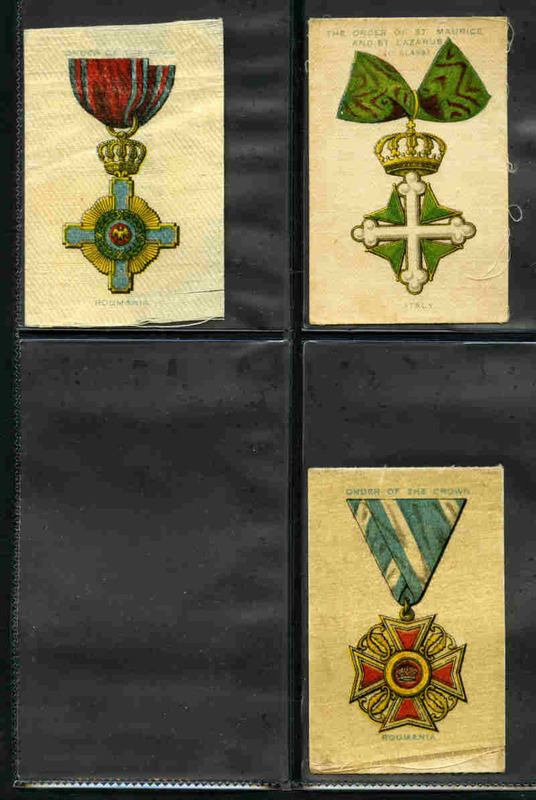 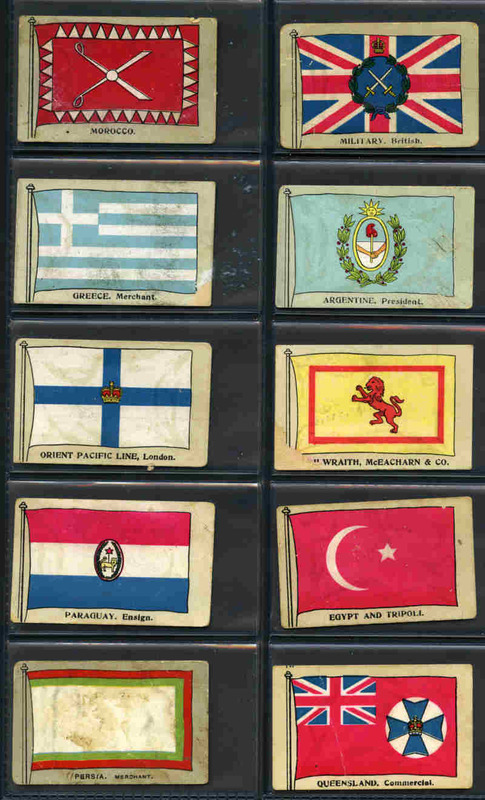 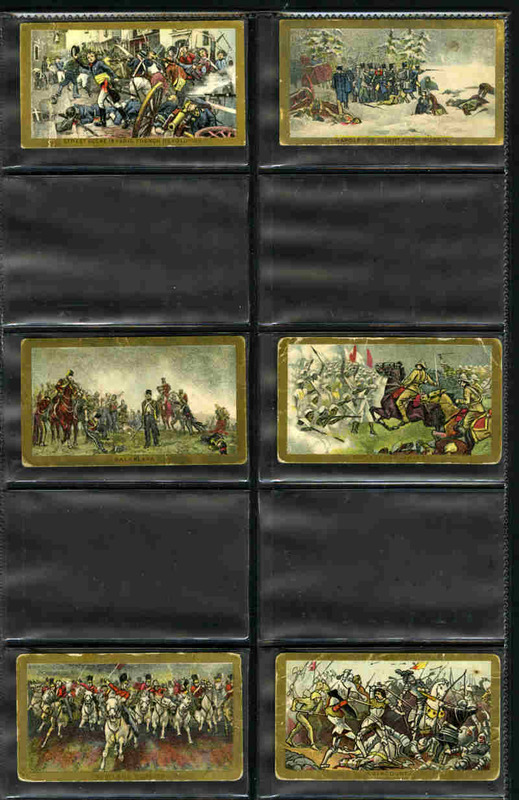 ATC and British Australasian Tobacco Co collection of 277 different cigarette cards including 1895 National Flags & Arms (20), 1900 Celebrities (21), 1900 Military Uniforms (20), 1900 Old and Ancient Ships (38), 1901 Australian Parliament (7), 1901 Battle Scenes (16), 1901 Boer War Series (40), 1901 Comic Scenes (15), 1905 Buildings (8), 1910 Flags of all Nations (69) and 1910 Fish from American Waters (21). 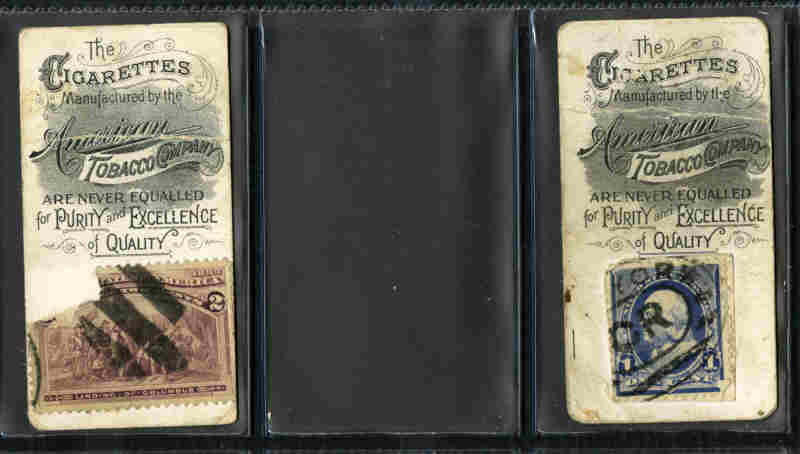 Some with faults, others in G/VG condition. 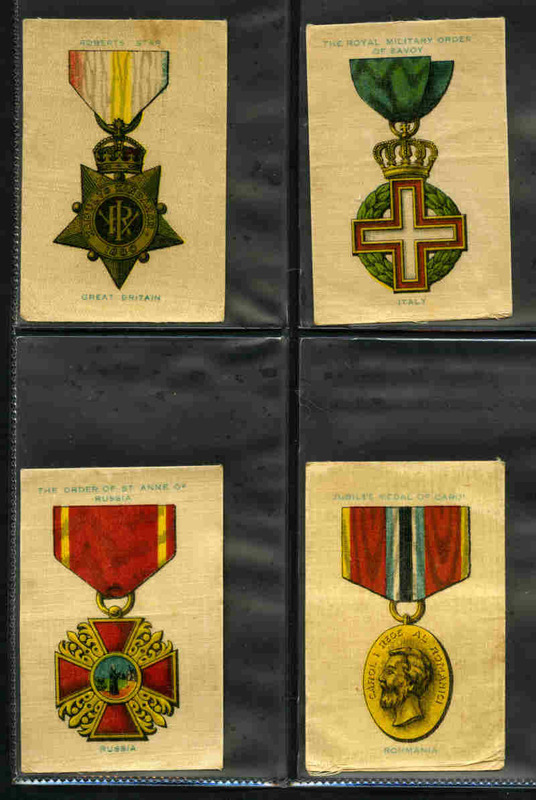 Catalogue Value £2,040.00. 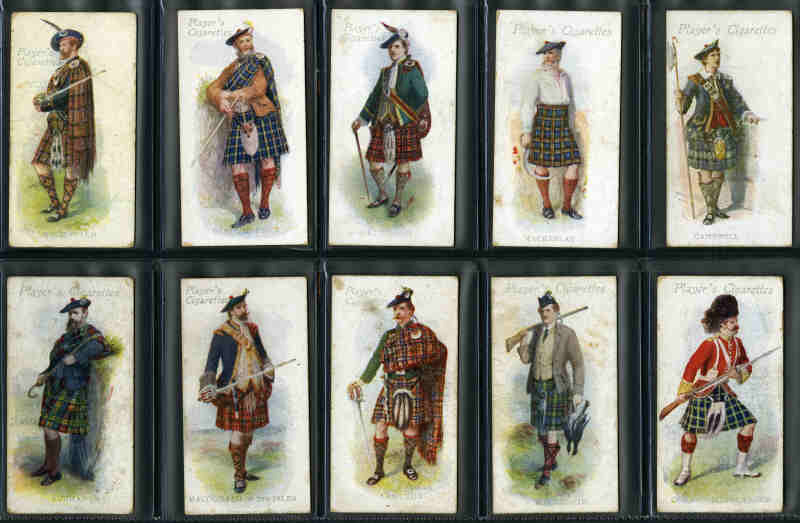 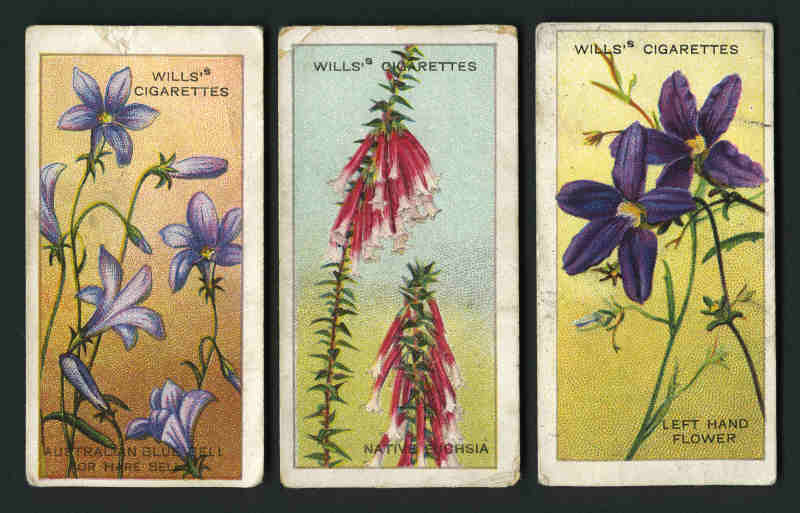 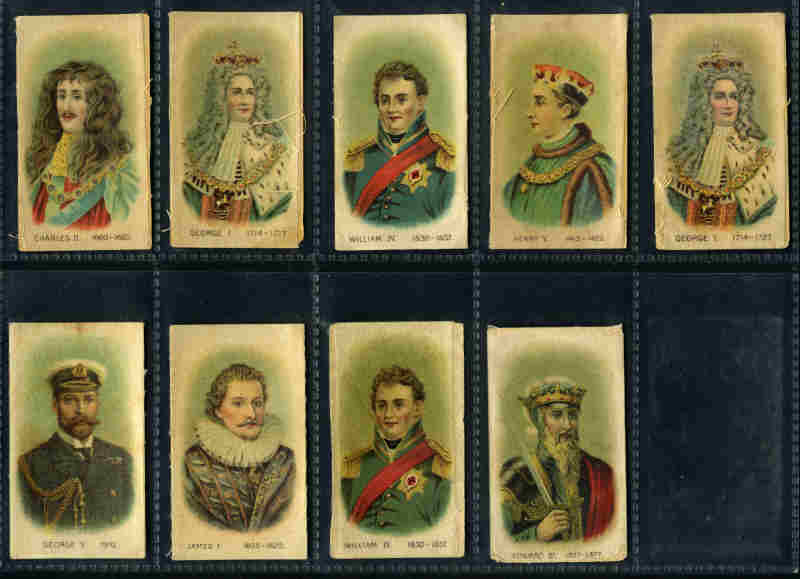 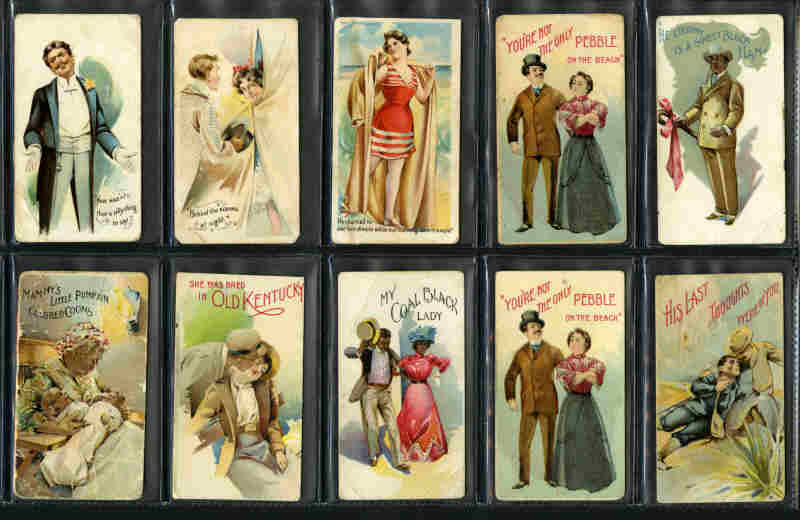 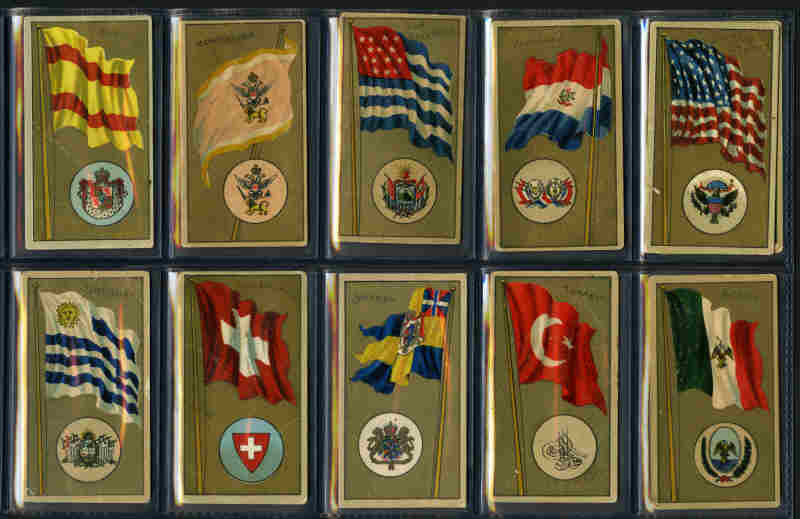 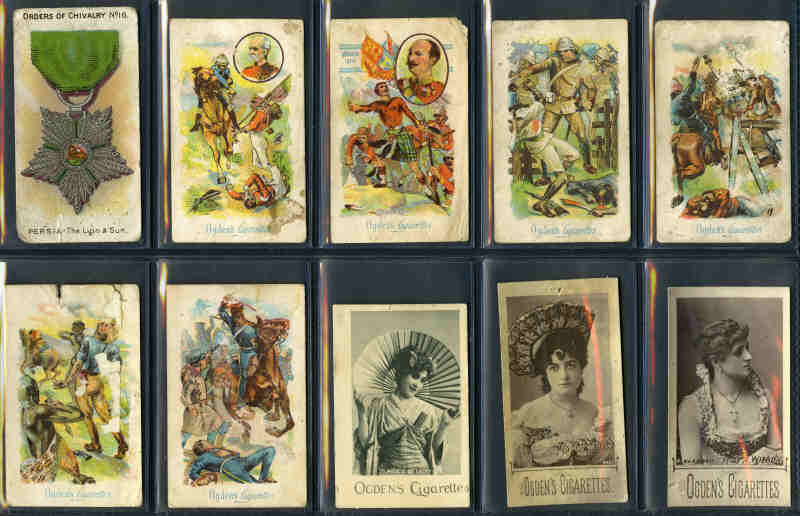 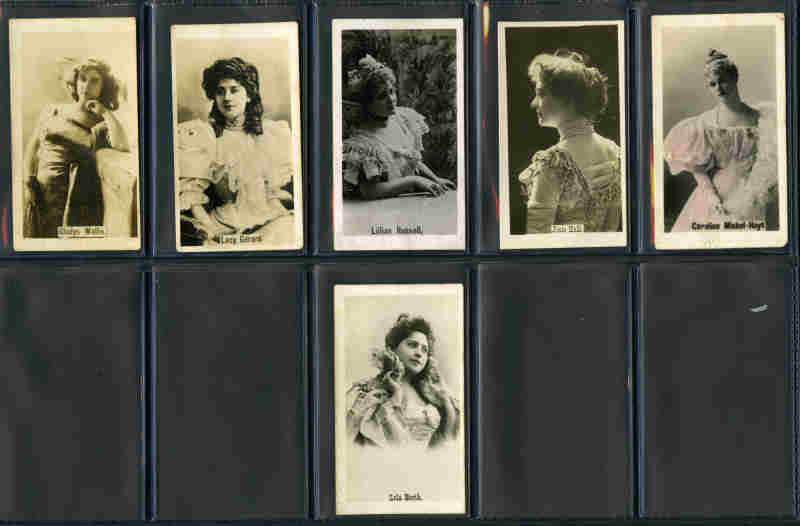 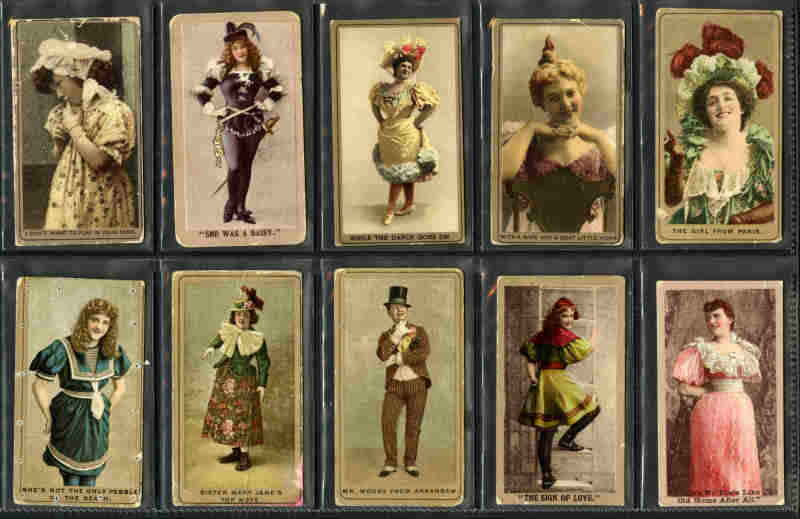 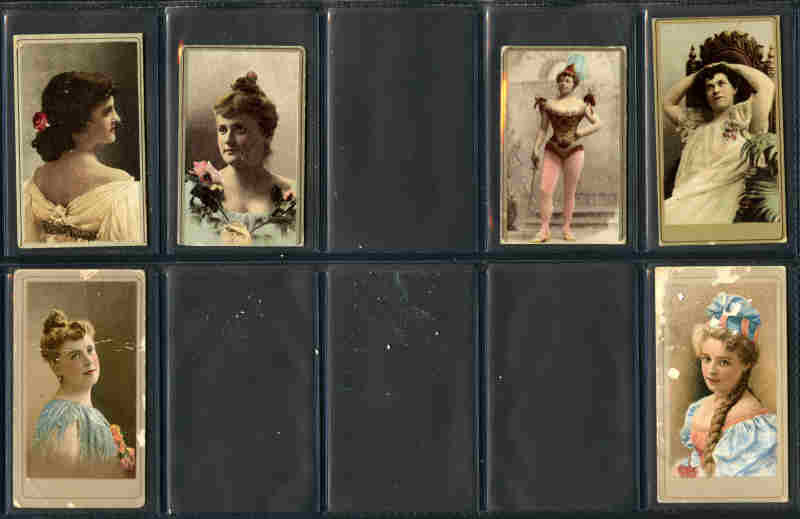 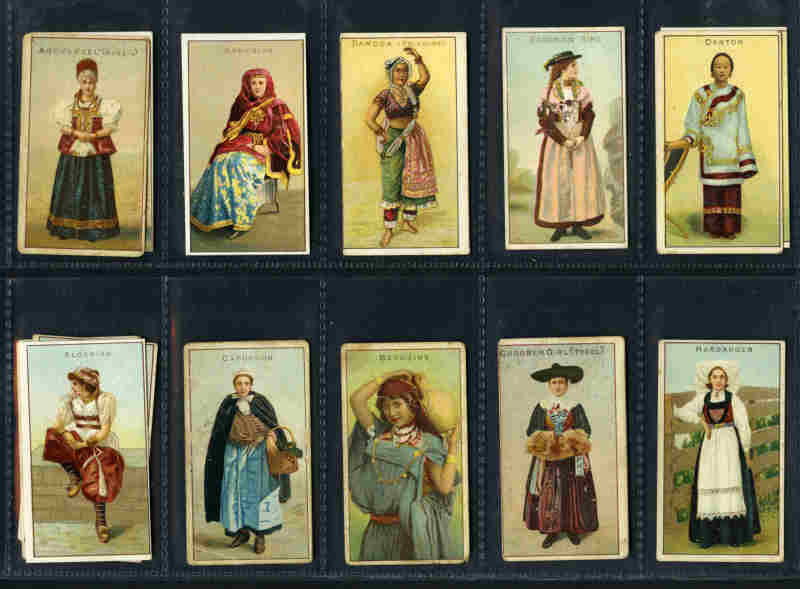 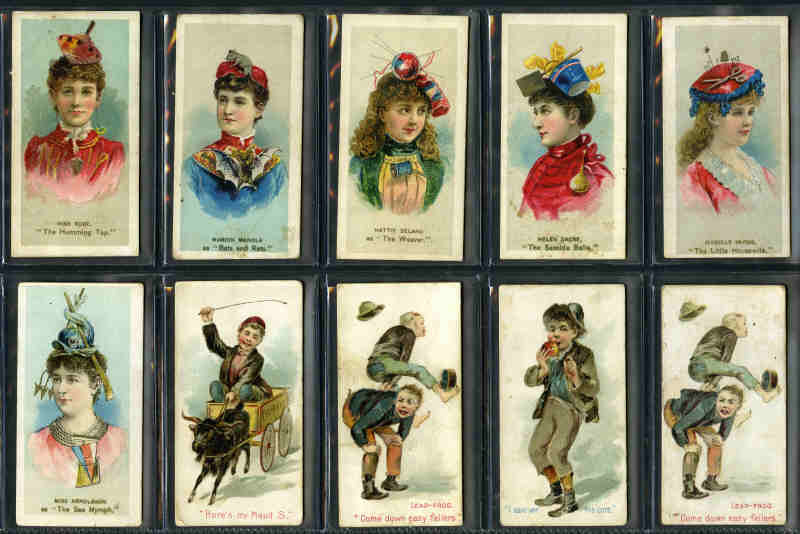 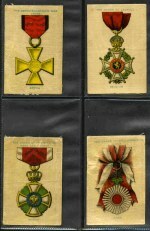 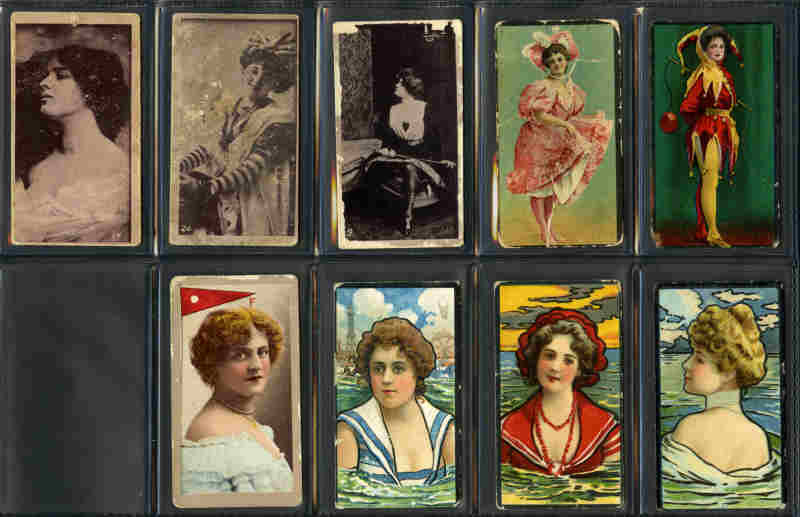 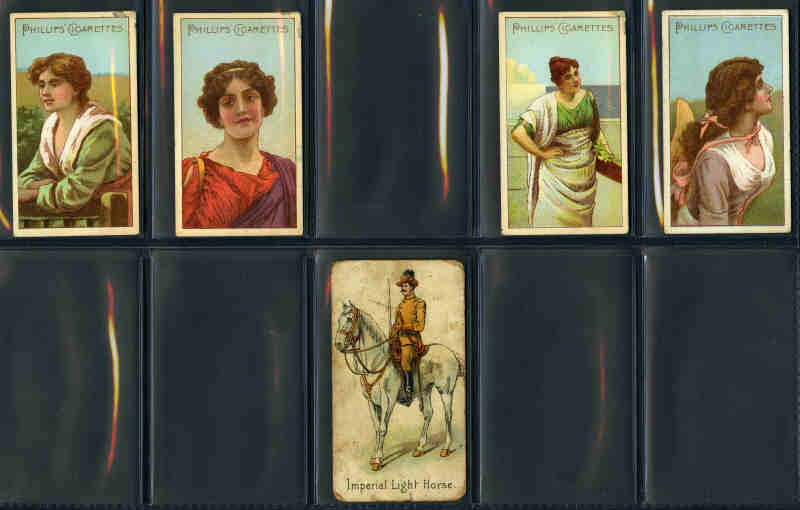 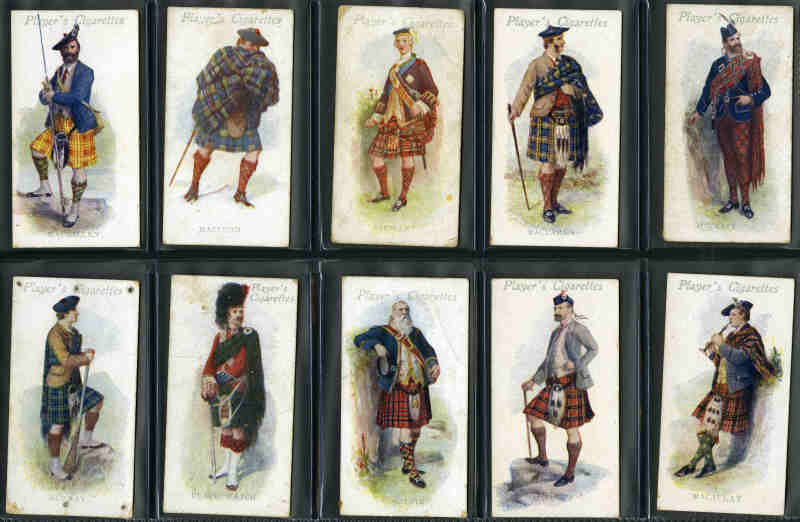 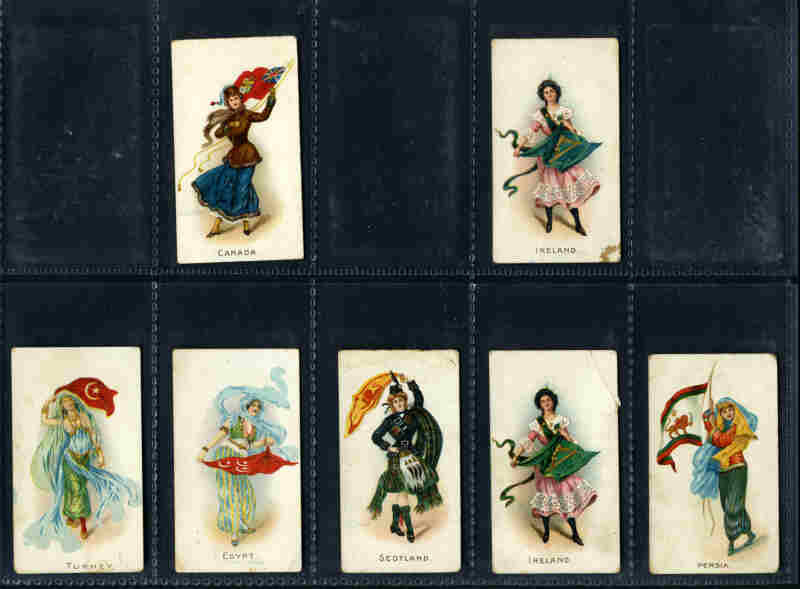 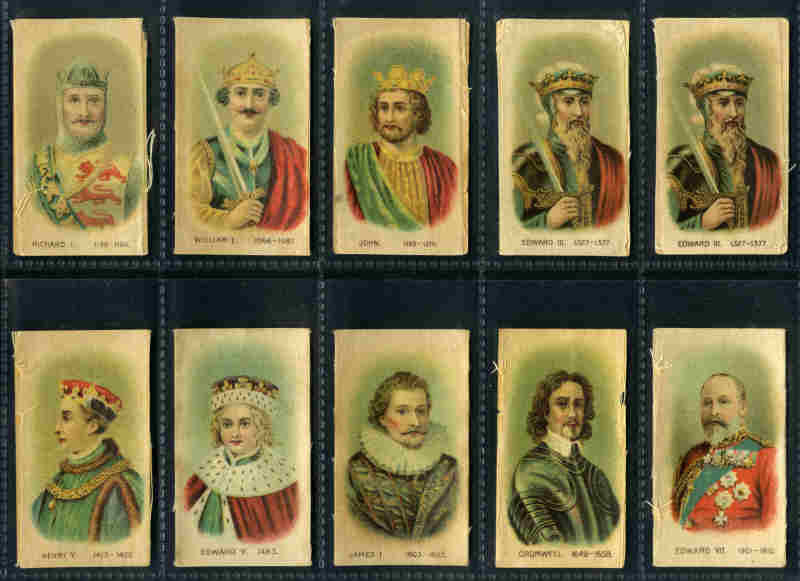 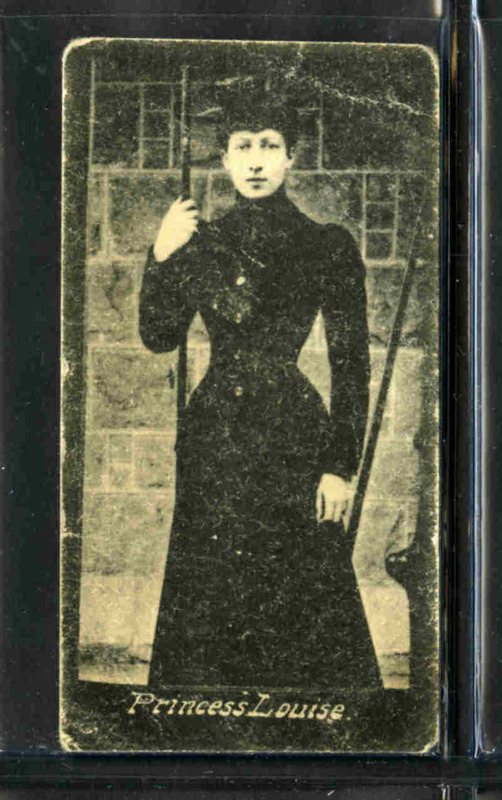 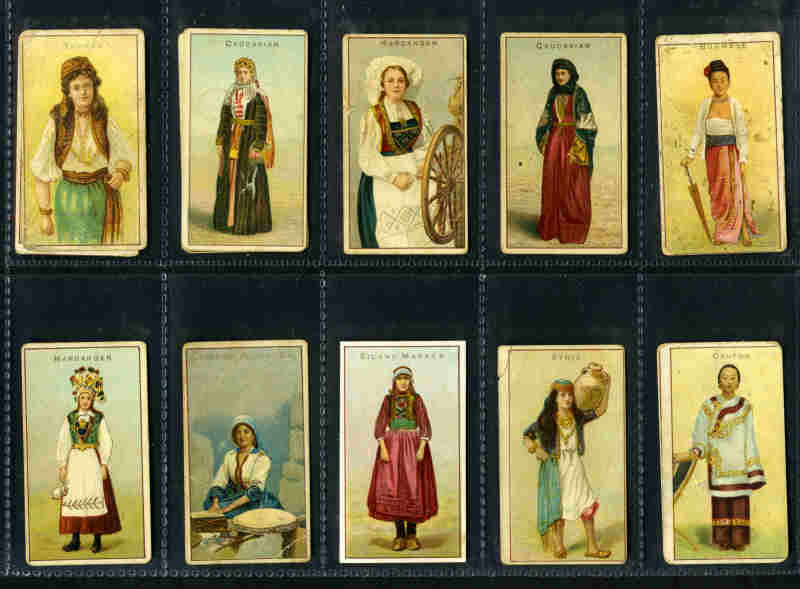 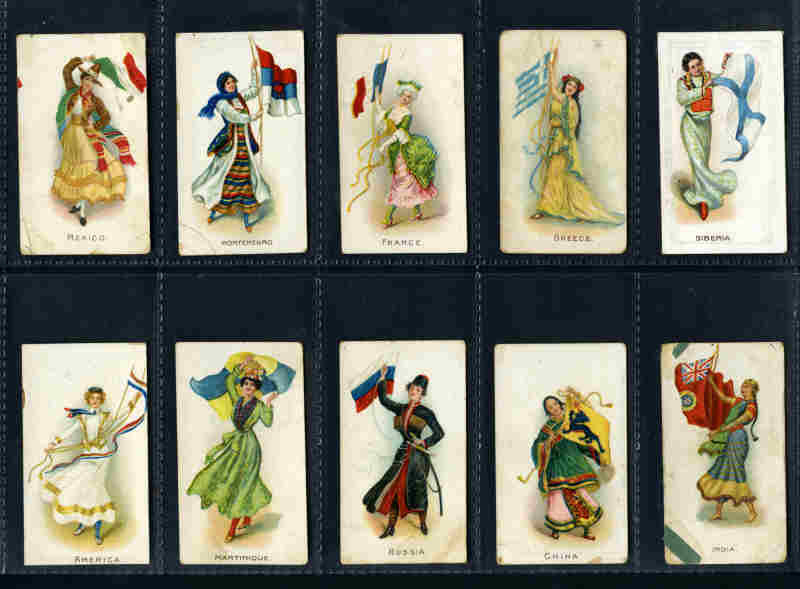 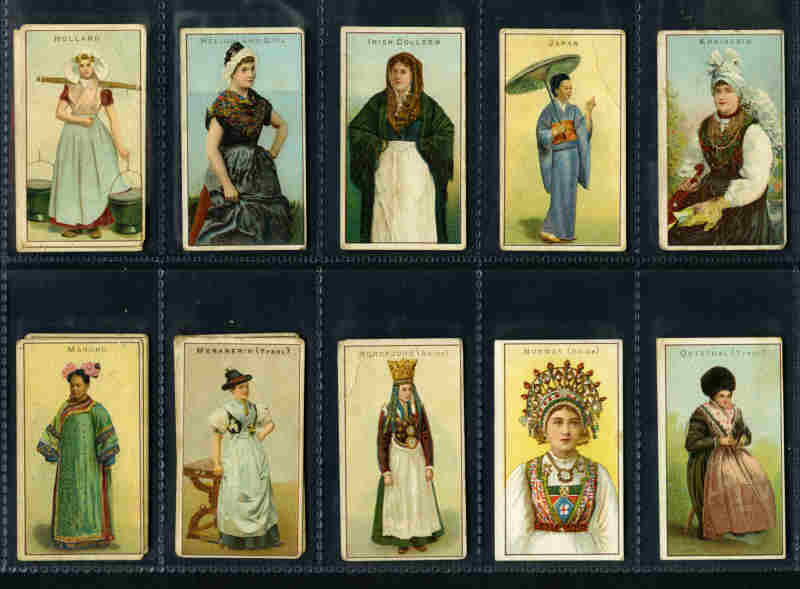 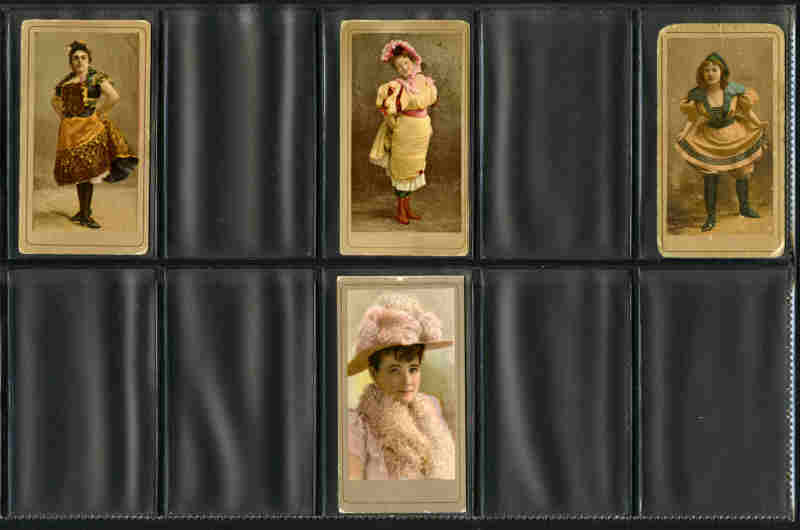 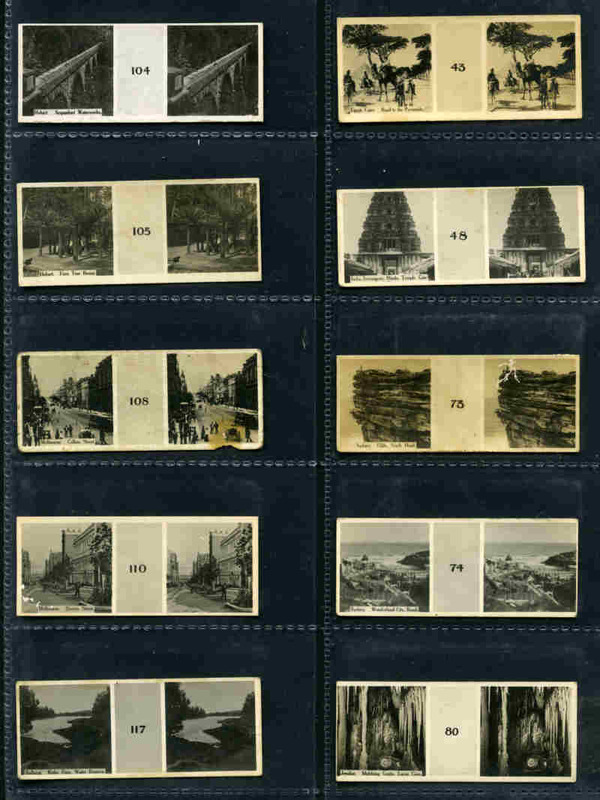 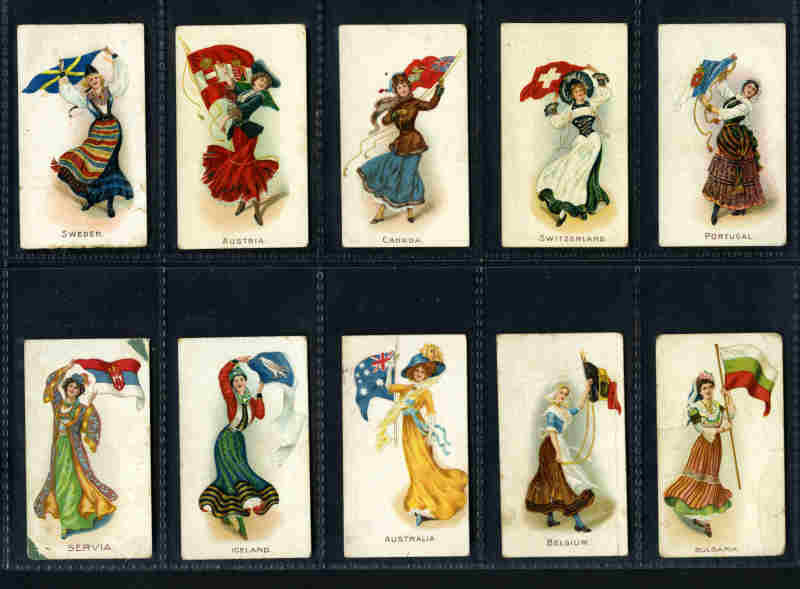 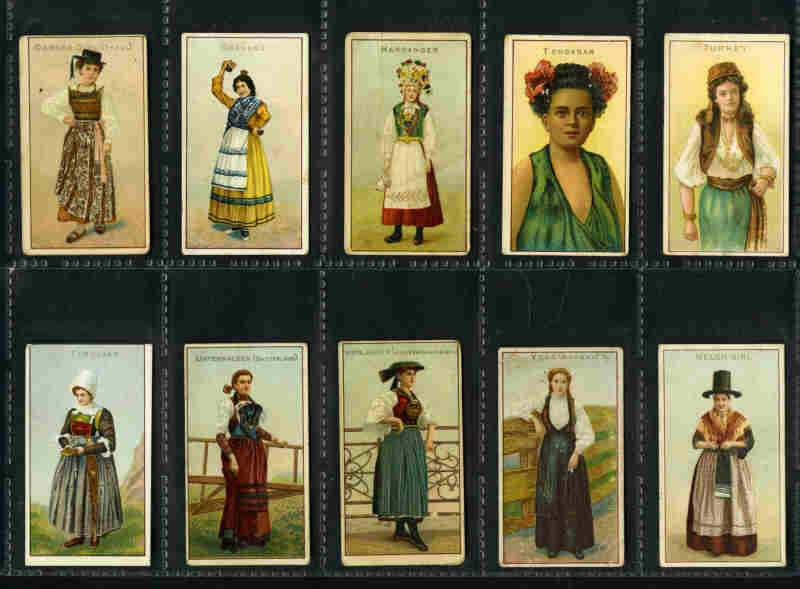 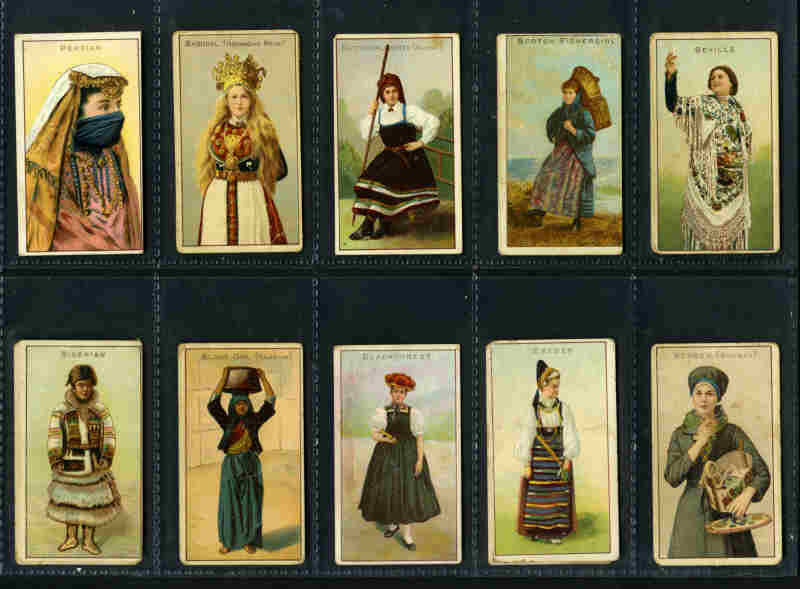 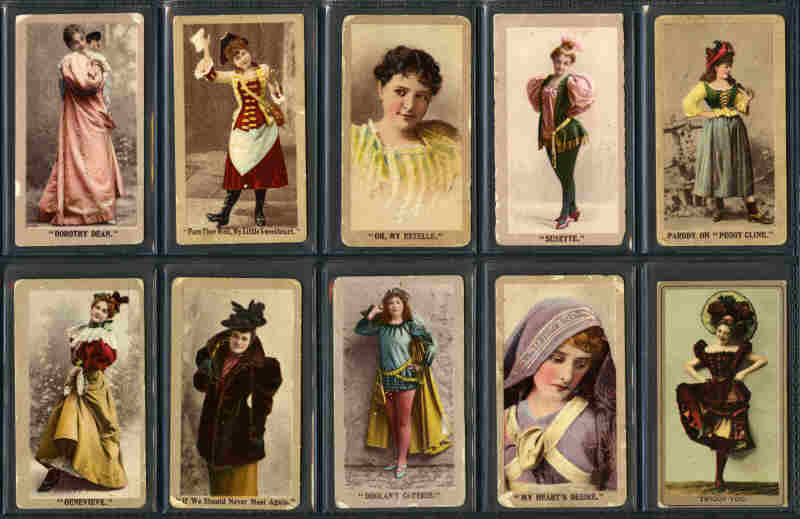 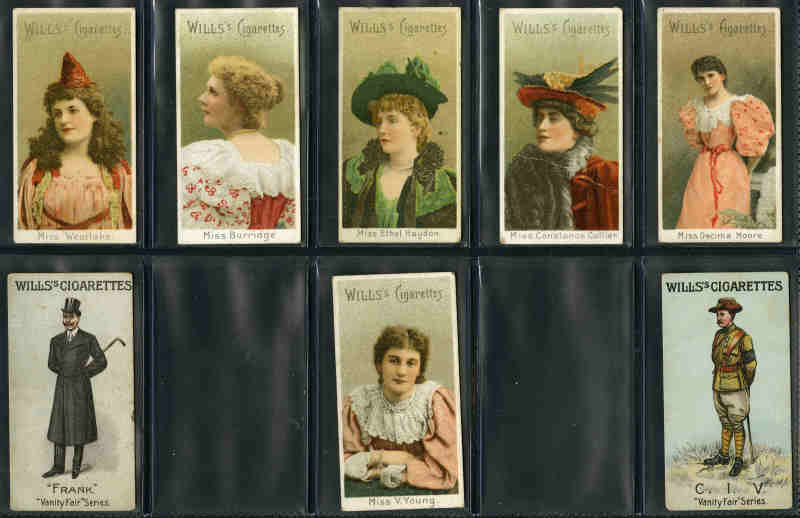 Wills selection of 458 mainly different cigarette cards including 1902 Soldiers of the World (7), 1908 Girls of all Nations (30), 1908 Views of the World (39), 1908 Girls of all Nations (50), 1910 Kings and Queens of England silks (19), 1910 Types of the Commonwealth Forces (25), 1914 Best Dogs of Their Breed (34), 1915 War Medals large silks (57), 1915 Victoria Cross Heroes (7, inc 3 Havelock Backs), 1916 Crest and Badges of the British Army silks (23), 1917 Sports of the World (58), 1925 Famous Film Stars (24) and 1929 Crests and Colours of Australian Universities, Colleges & Schools (38). 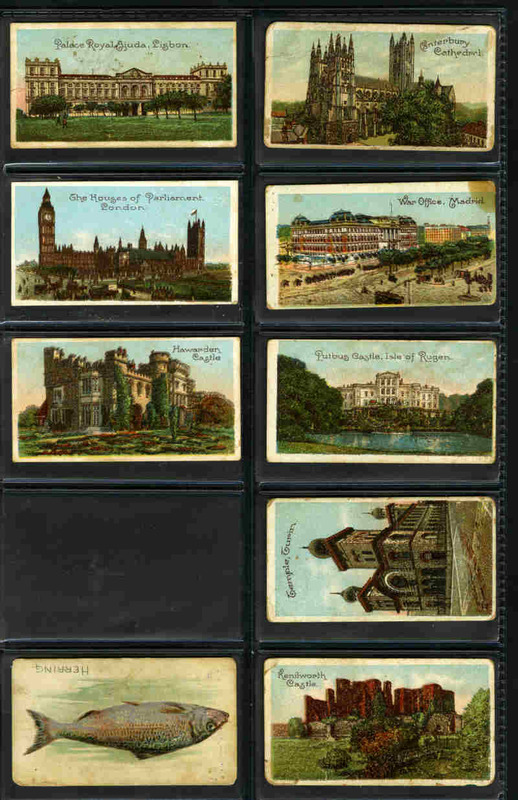 Some faults, but many in G/VG condition. 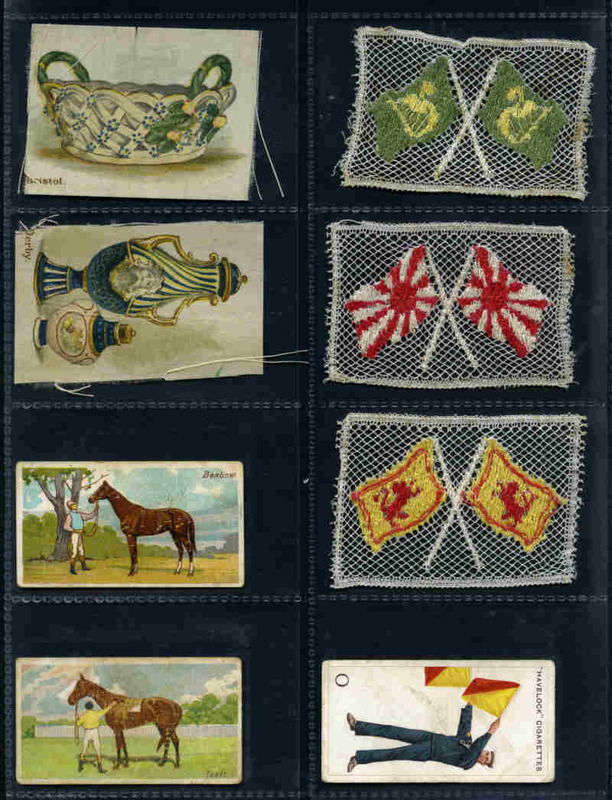 Catalogue Value £1,420.00. 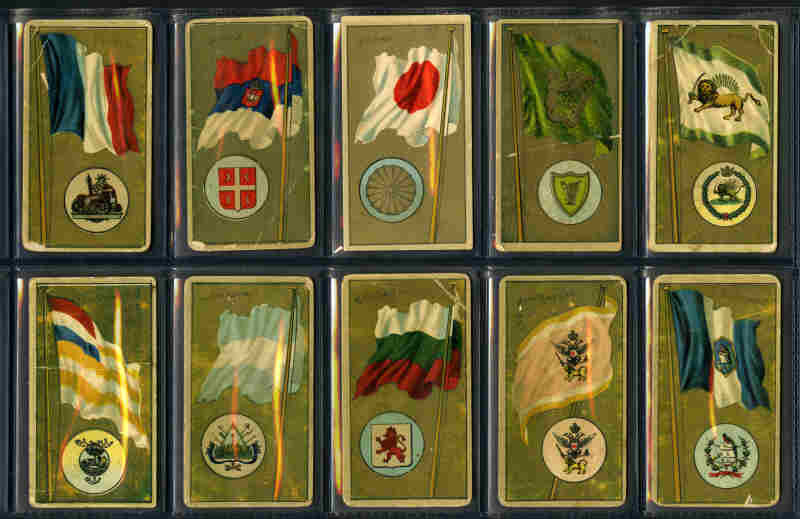 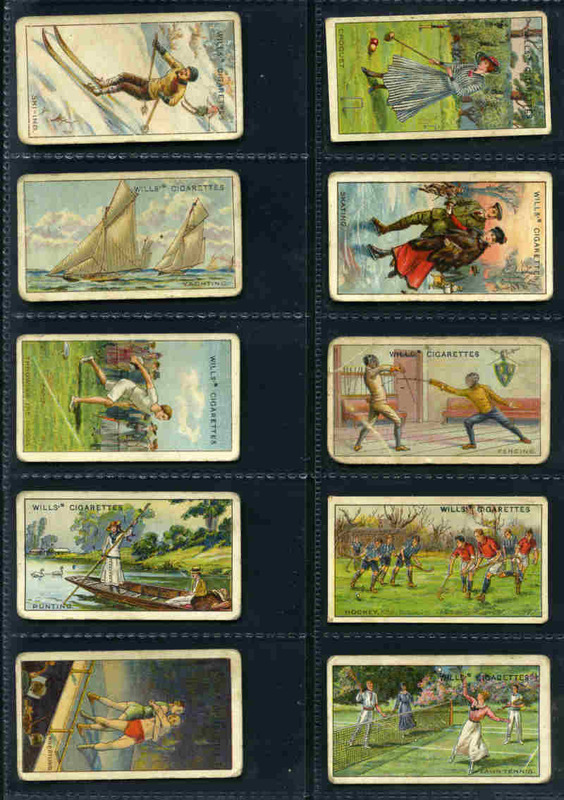 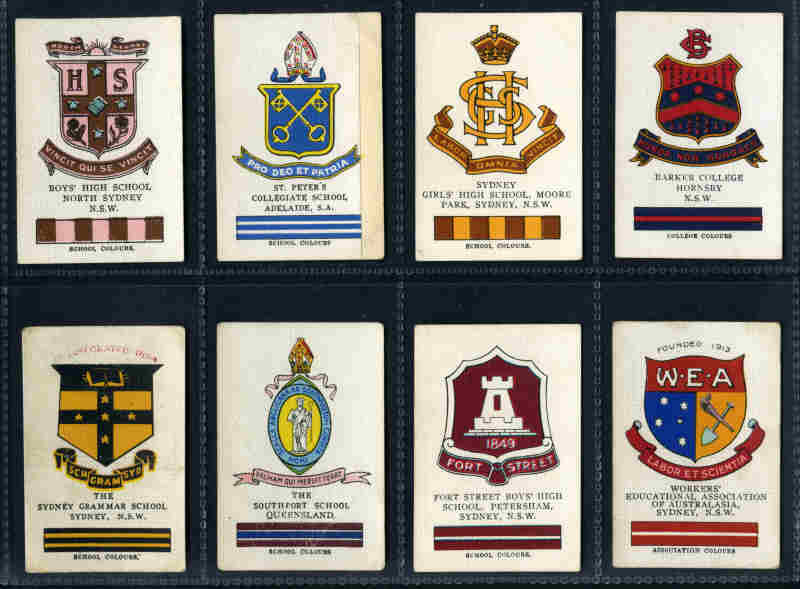 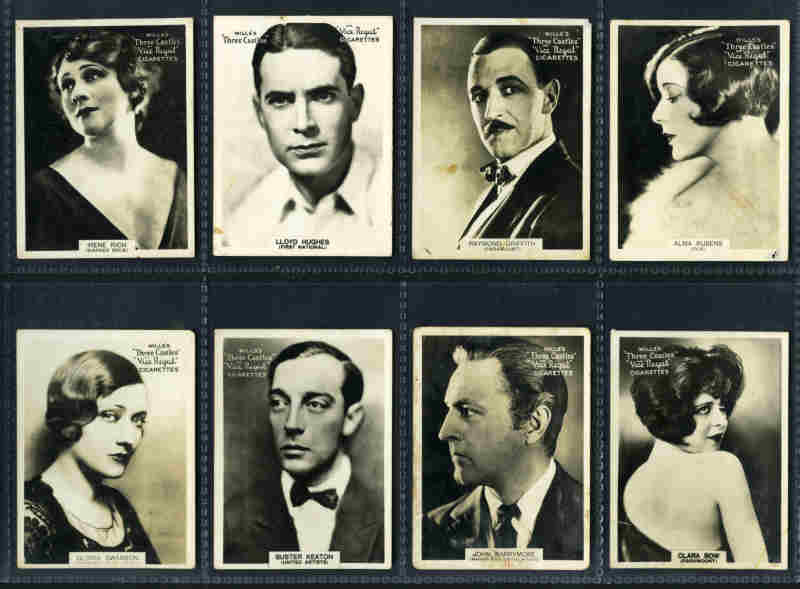 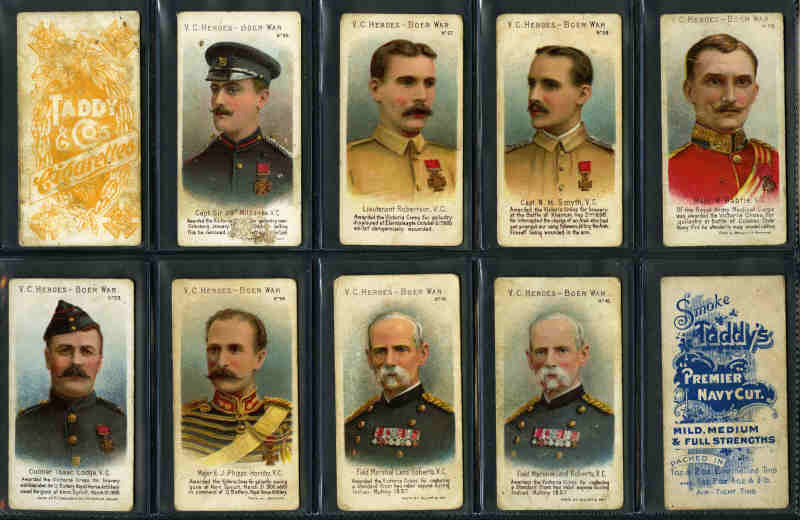 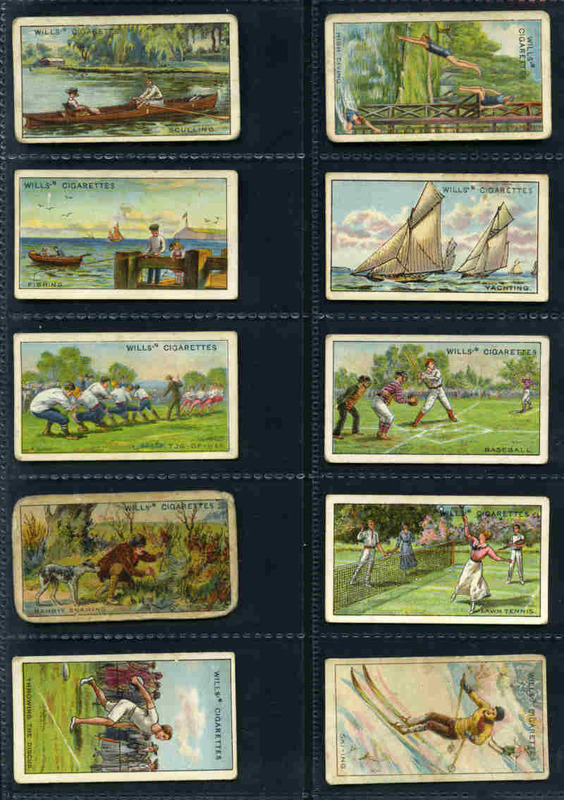 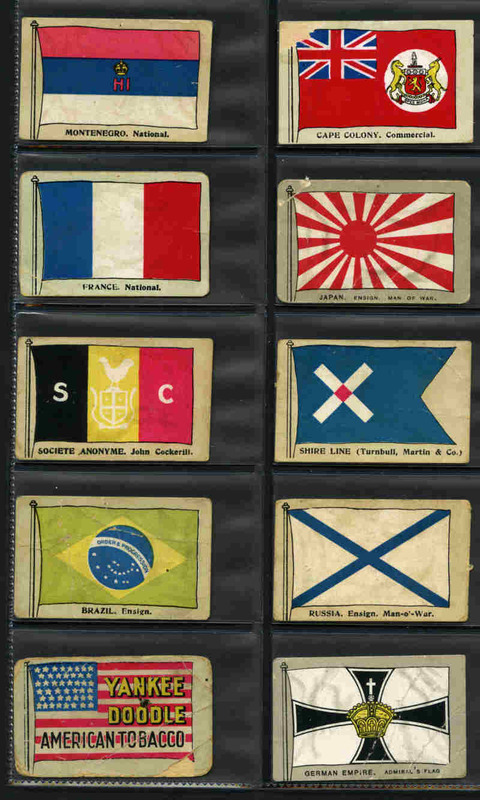 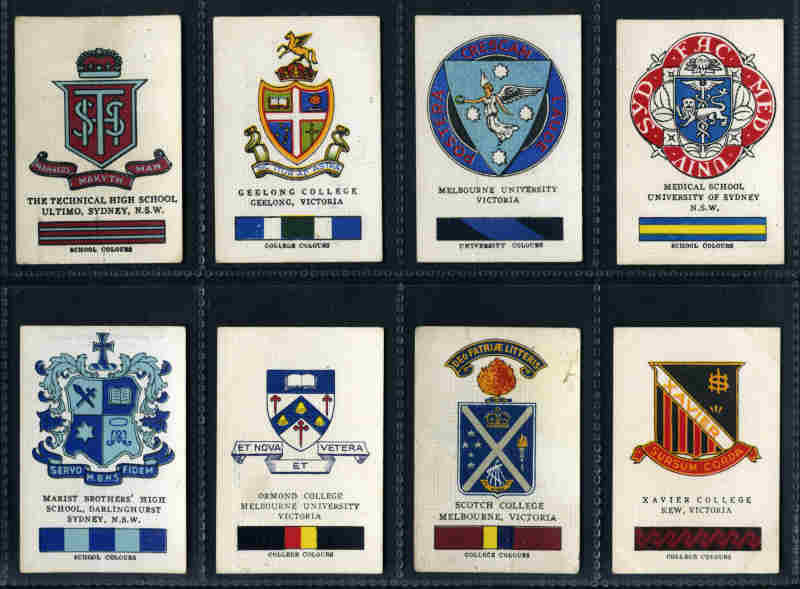 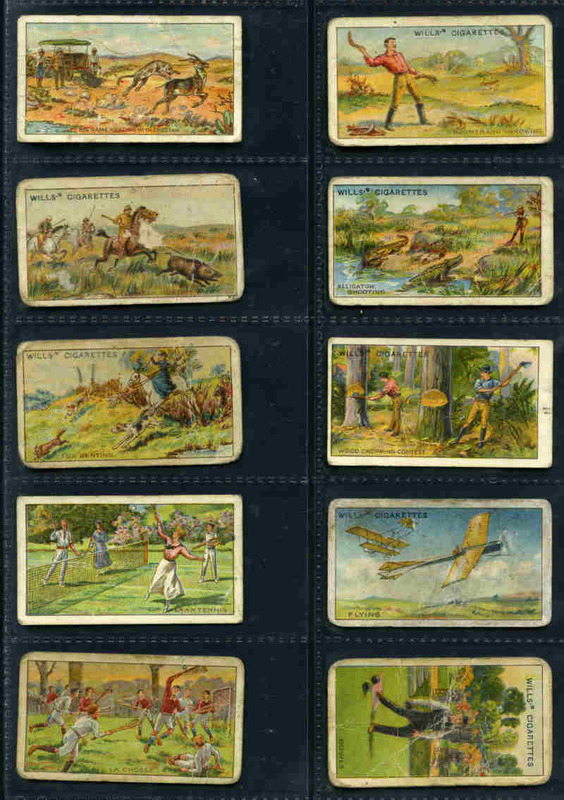 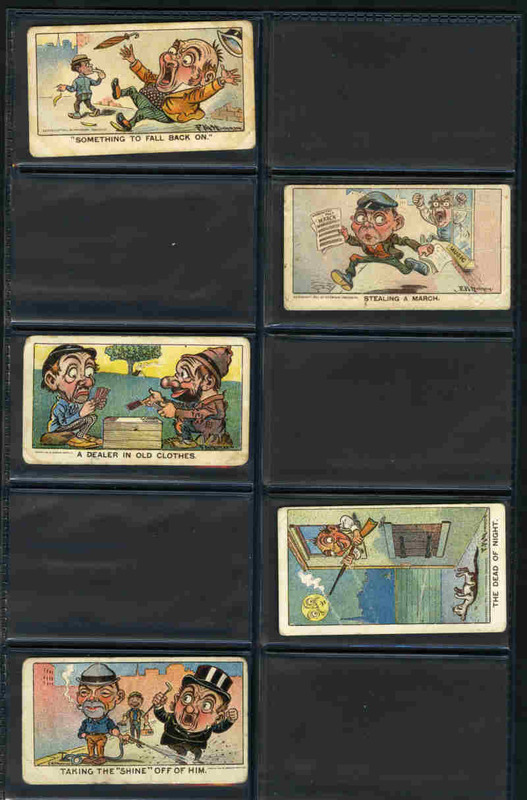 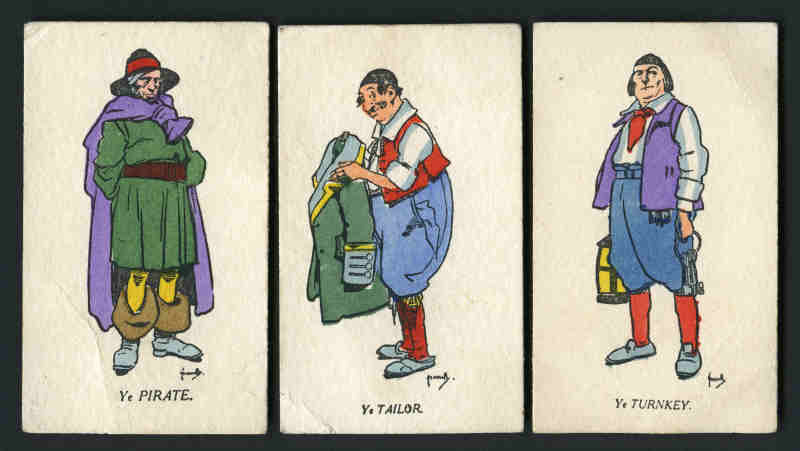 Wills selection of 260 different cigarette cards including 1908 Flag Girl of all Nations (7), 1912 Birds of Australasia Yellow Back (77), 1915 War Incidents A Series (26) and 2nd Series (26), 1916 Merrie England Studies (9) and 1933 Footballers 1933 (37). 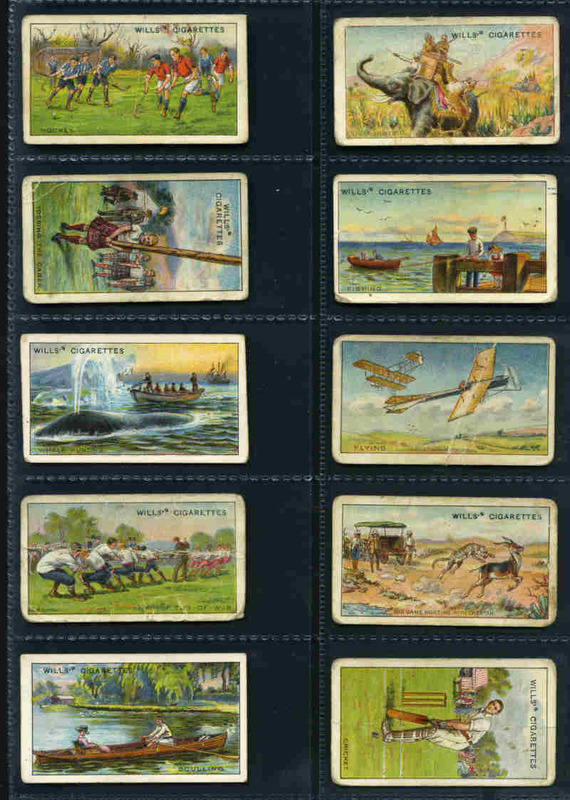 Some faults, but many in G/VG condition. 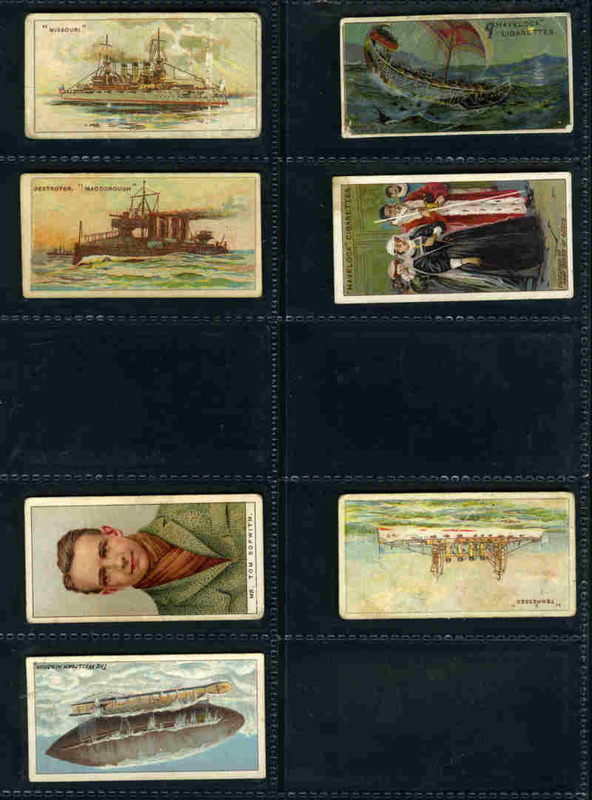 Catalogue Value £480.00. 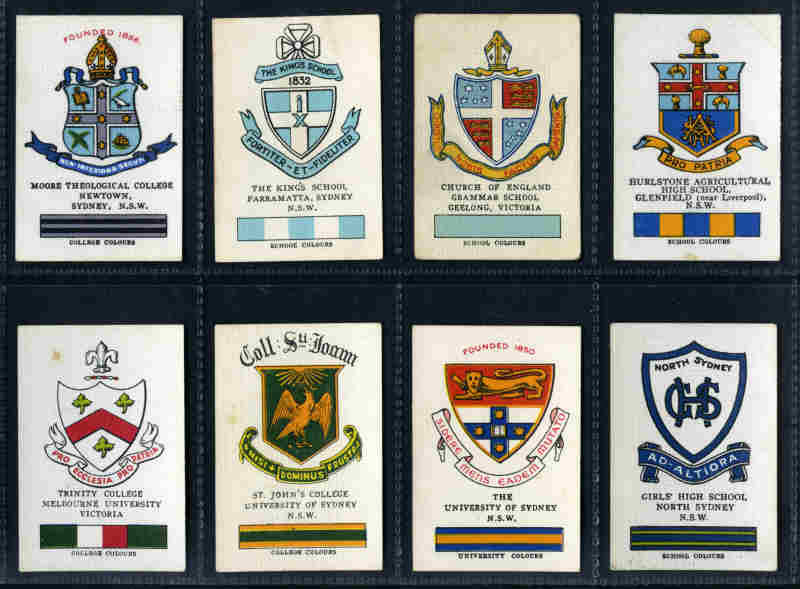 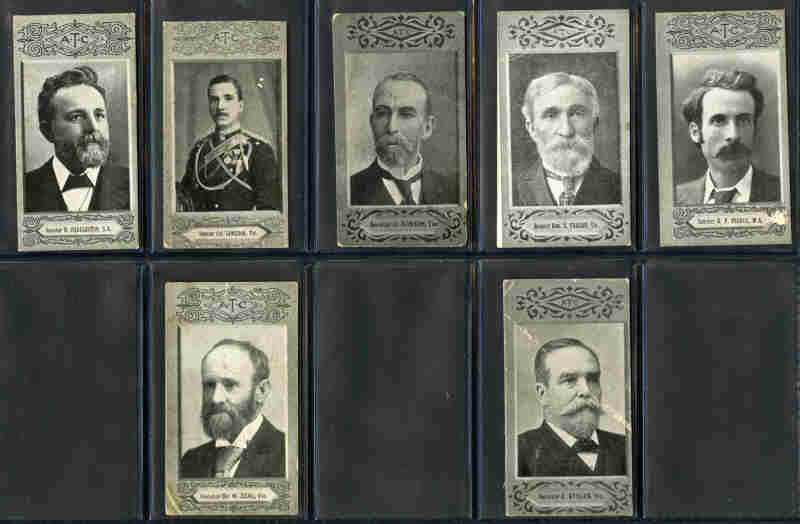 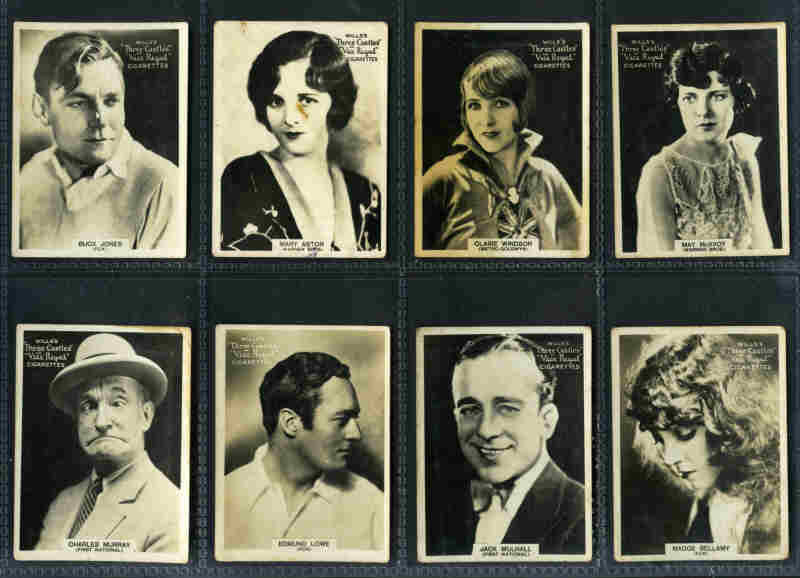 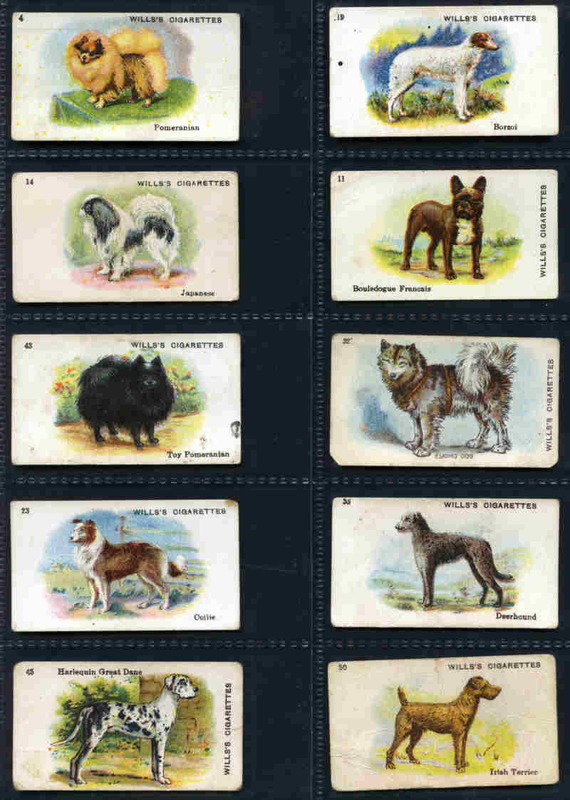 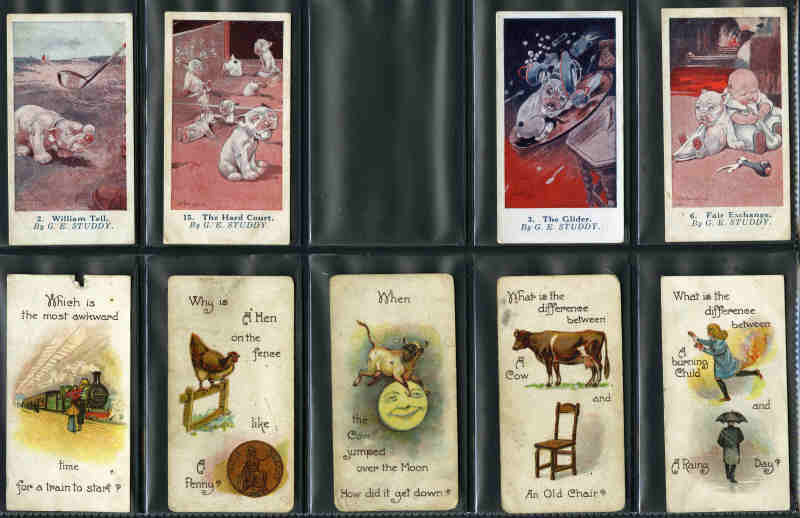 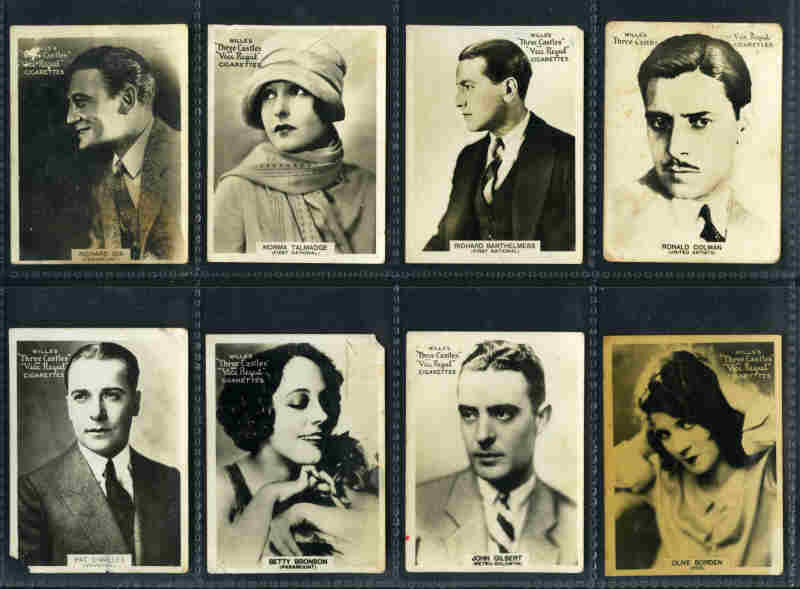 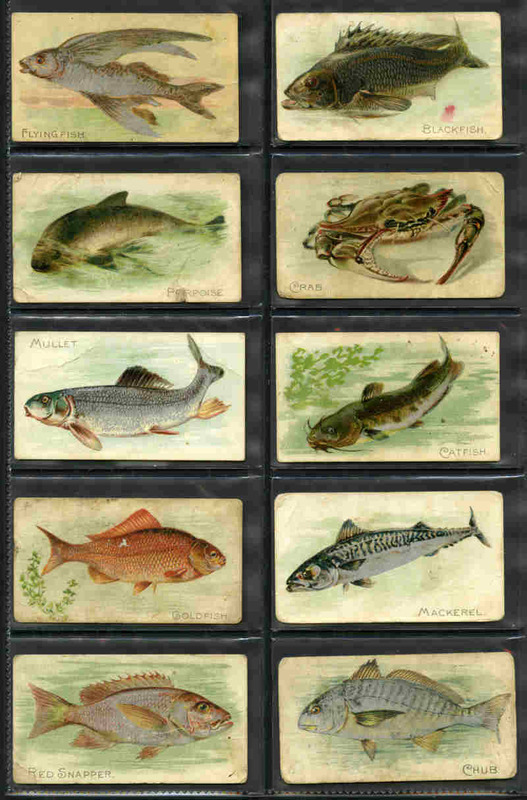 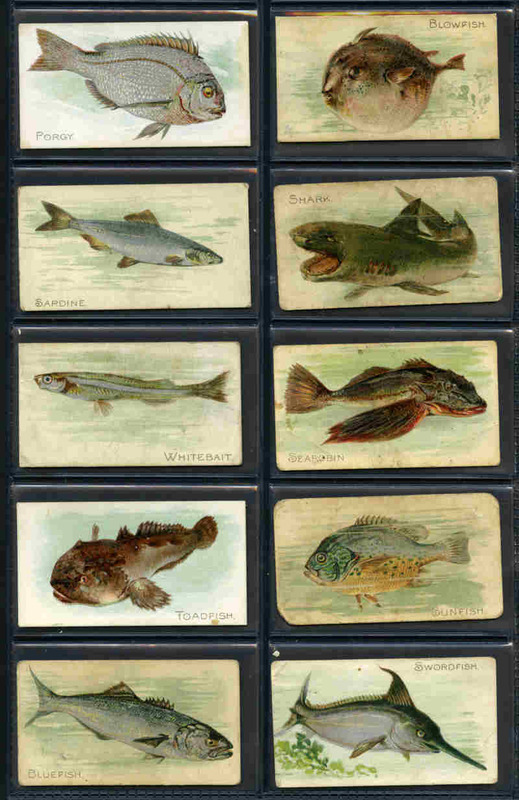 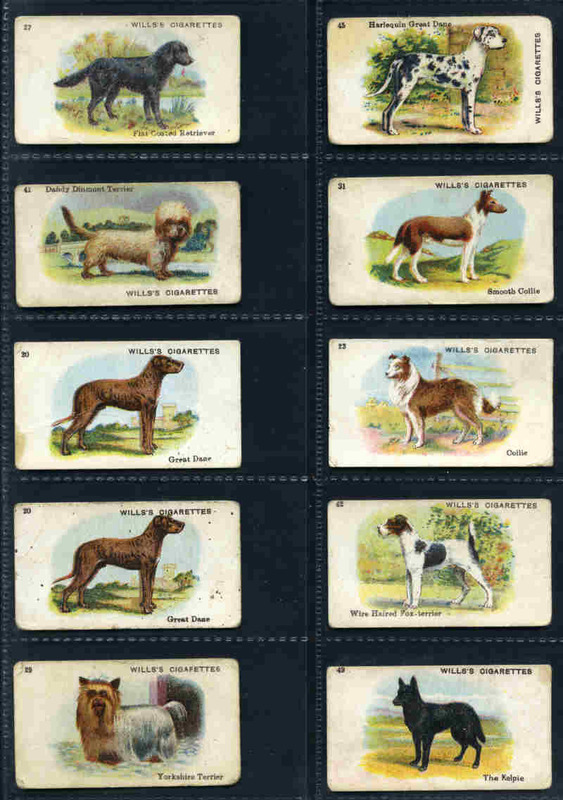 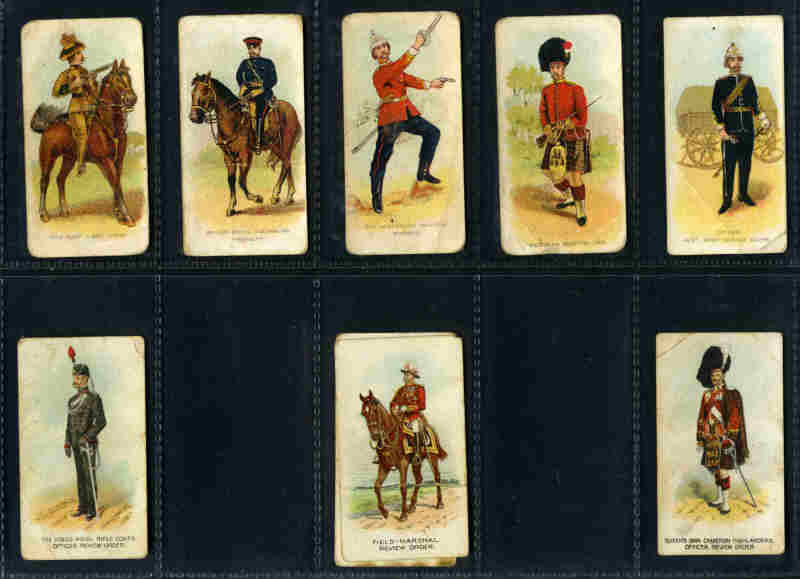 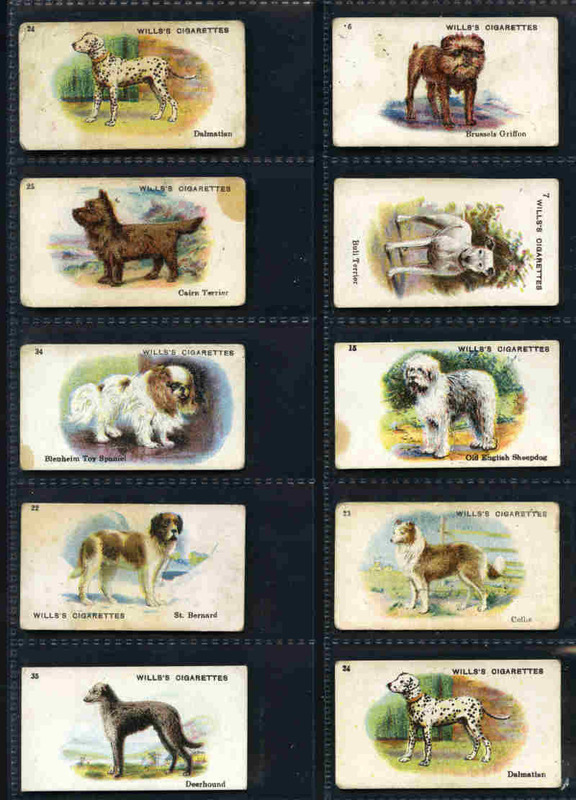 Collection of 452 different cigarette cards including Carreras 1926 Horses and Hounds (21), Co-Operative Wholesale Society (C.W.S.) 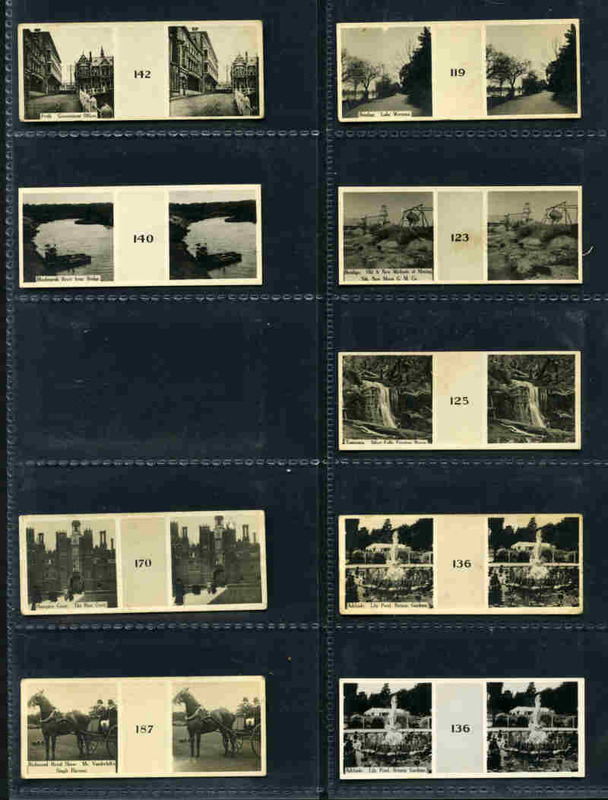 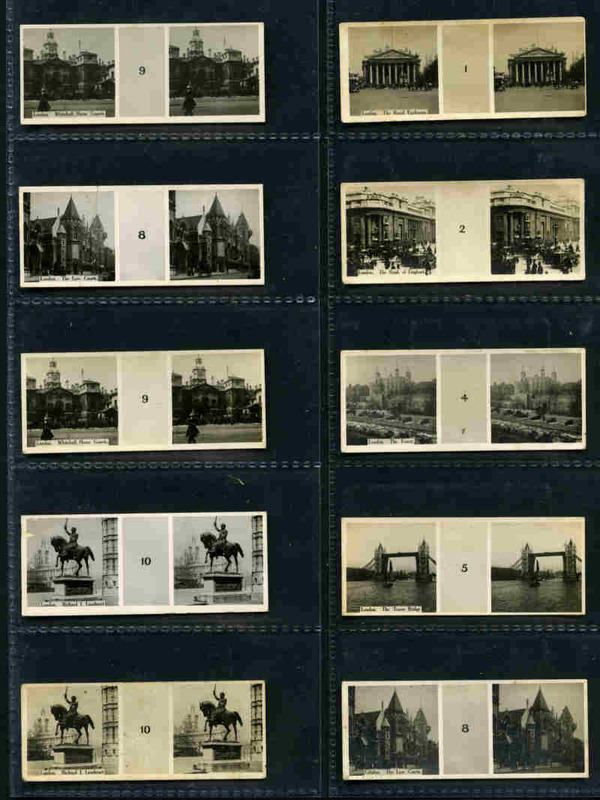 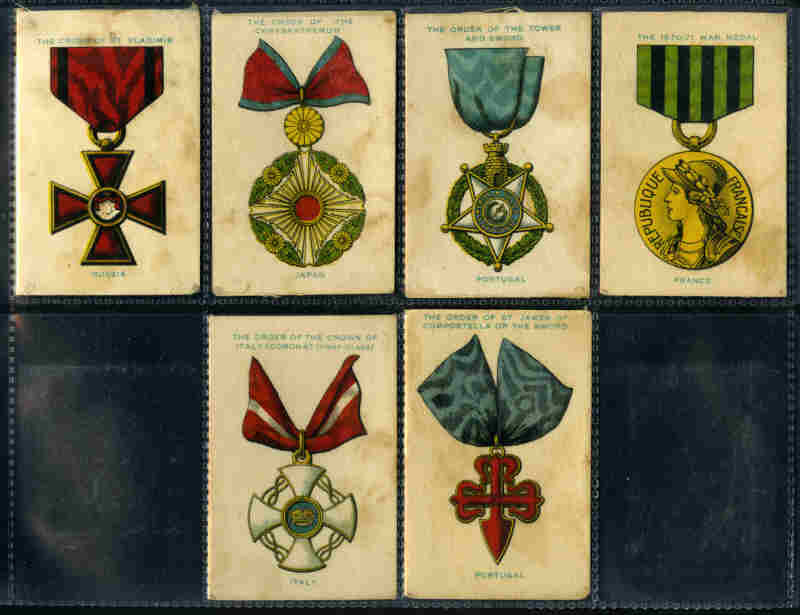 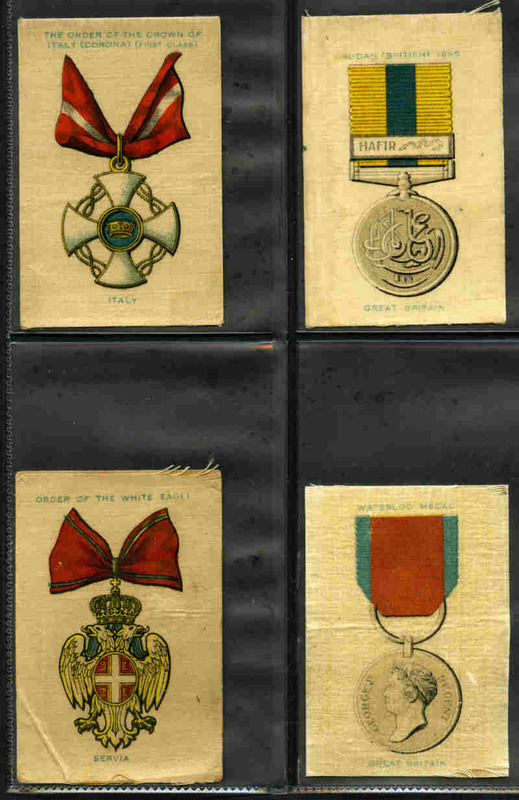 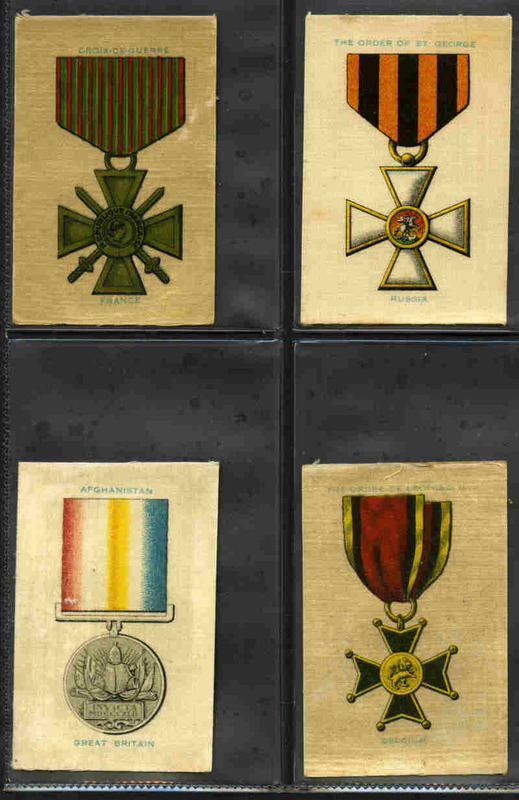 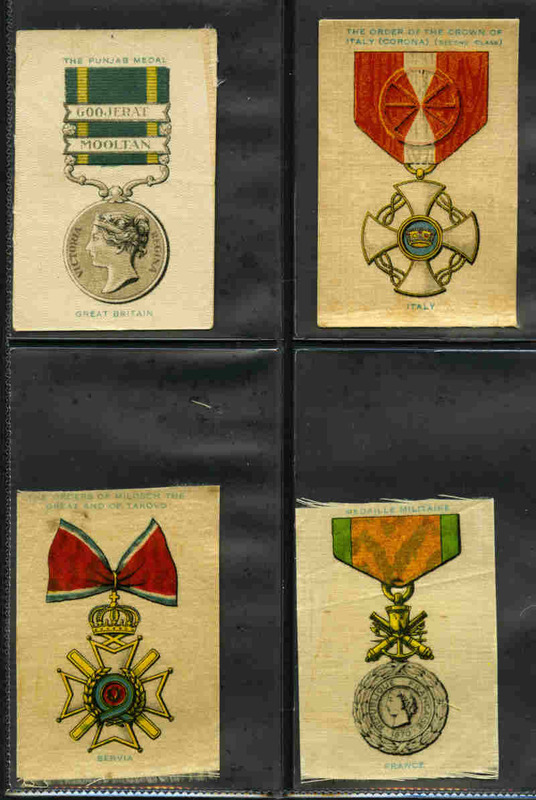 1934 Musical Instruments (28), Gallaher 1915 Flags Silk (9), 1925 Famous Footballer Green Back (86), Godfrey Phillips 1925 Kings & Queens of England (33), Richard Lloyd 1936 Atlantic Records (17), Millhoff 1932 Real Photographs 4th Series set of 27, Morris Ltd 1937 Captain Blood set of 25, Players 1904 British Empire Series (48), 1909 Country Seats and Arms (47), 1926 Ship-Models (16), 1930 Cricketers (46) and Wills (New Zealand) 1925 Etchings Dogs (23) and 1926 Warships (13). 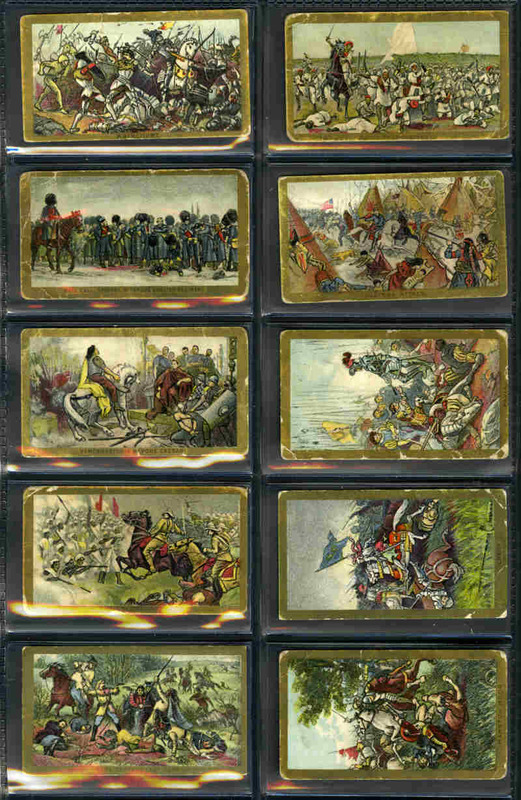 Mainly VG/Excellent condition.